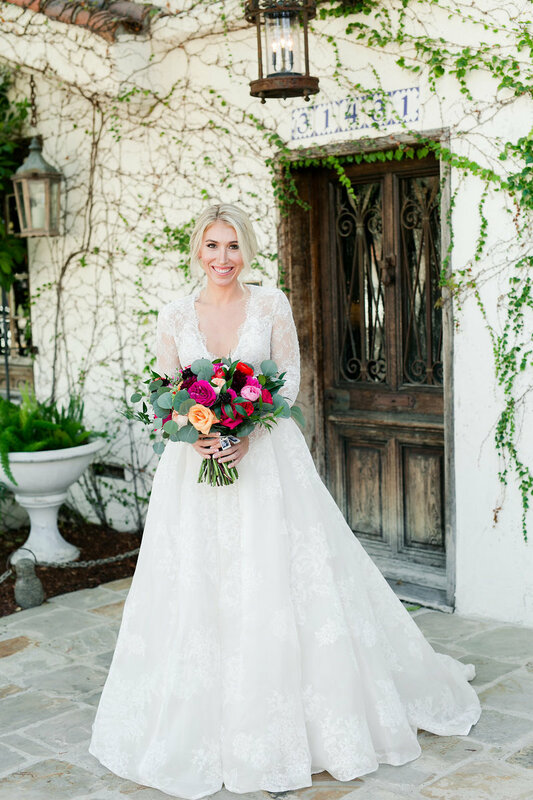 This was a wedding fit for a princess, literally! 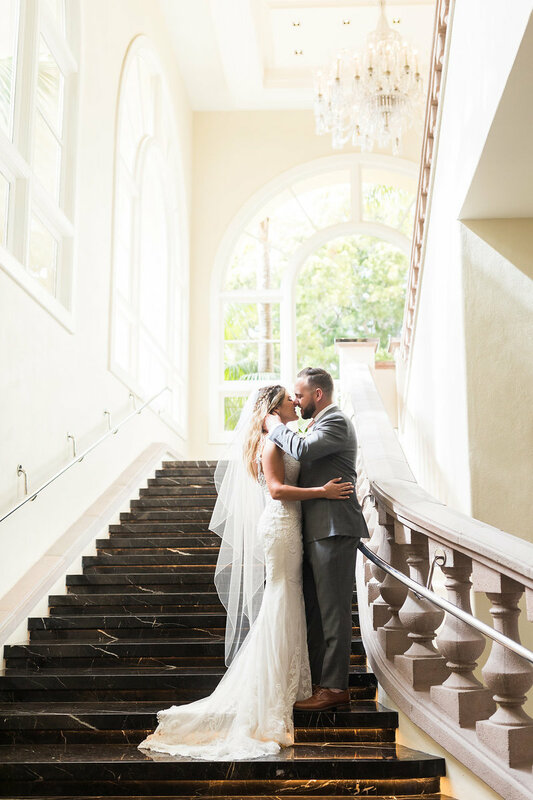 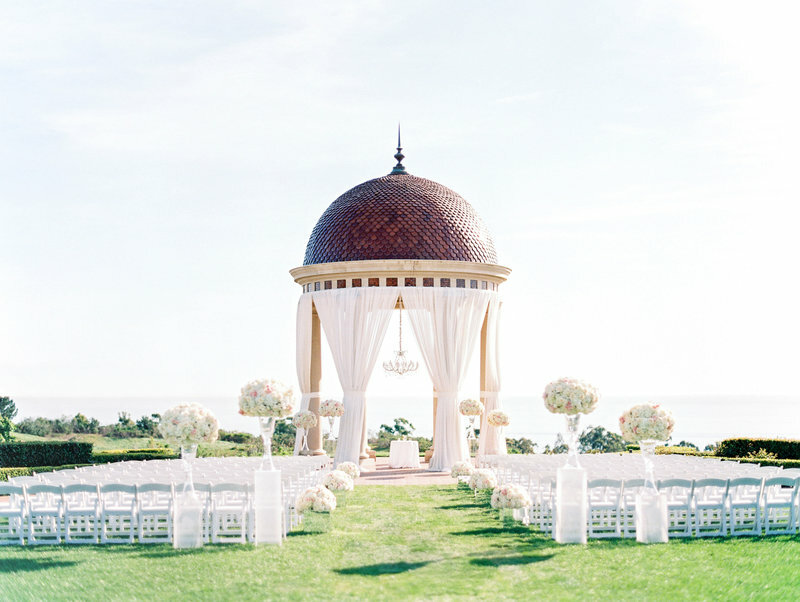 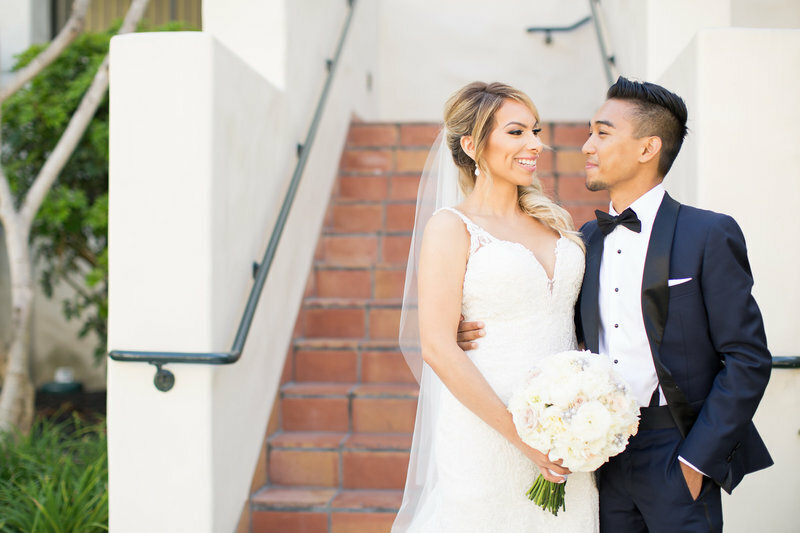 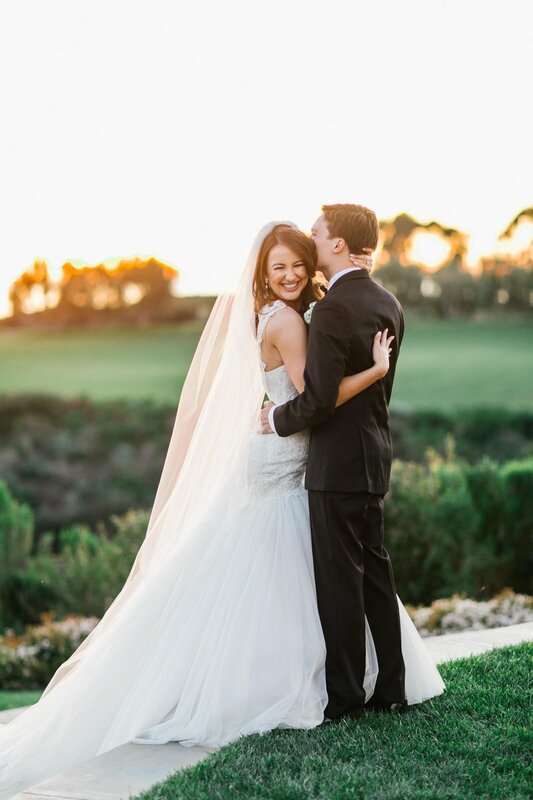 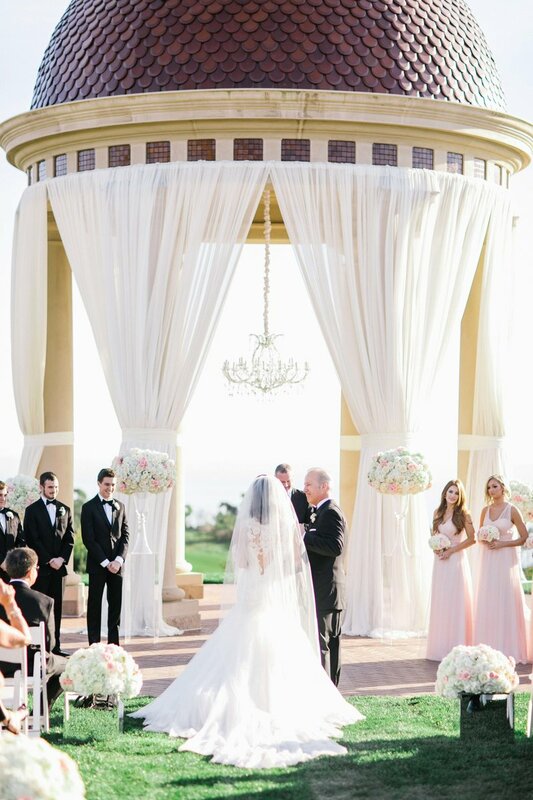 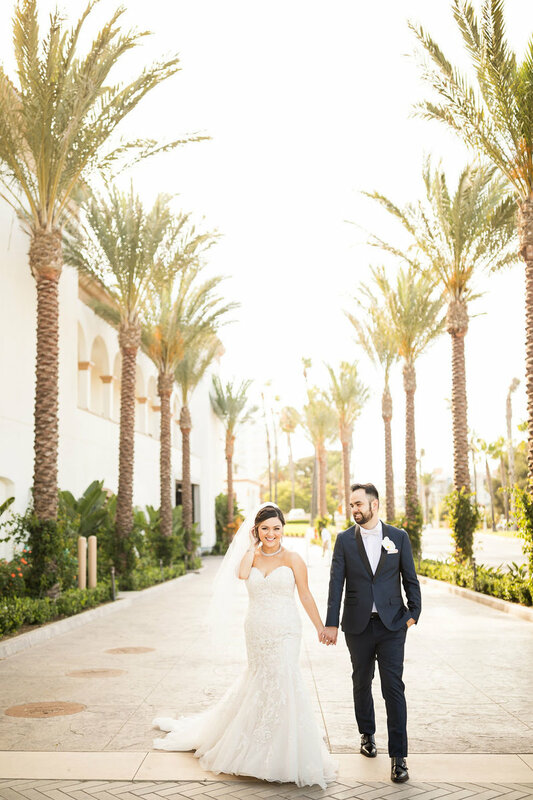 Former princess Belle met her Prince Charming and wed under the Pelican Hill rotunda. 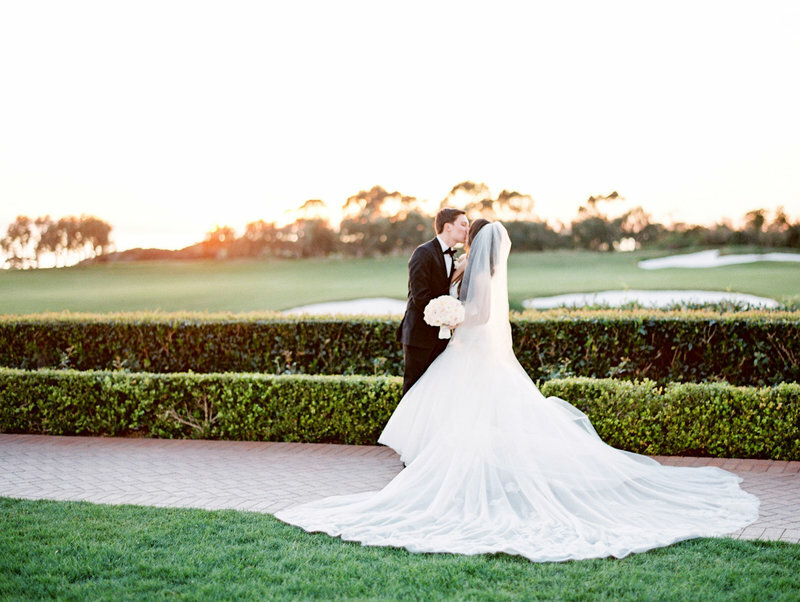 Childhood dreams came true that day for both Heather & Alec, and it was truly a fairytale. 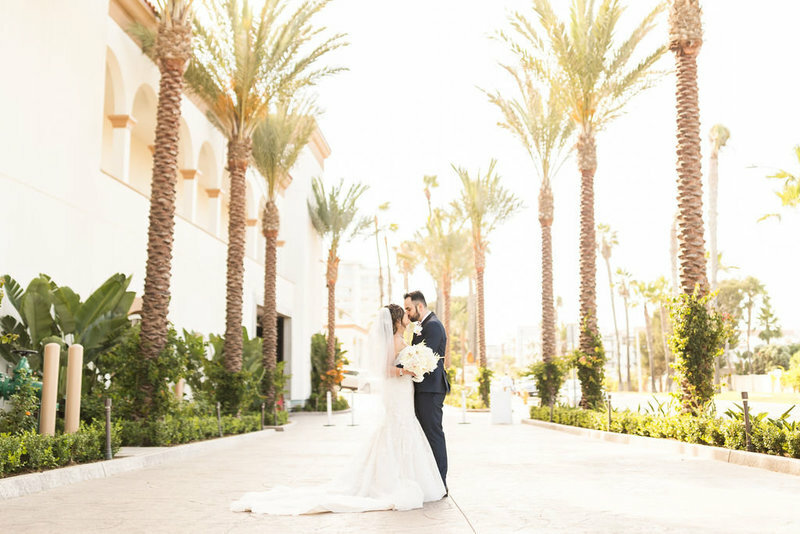 The elegance, glamour, romance and awe-inspiring love between them made our hearts skip a beat. 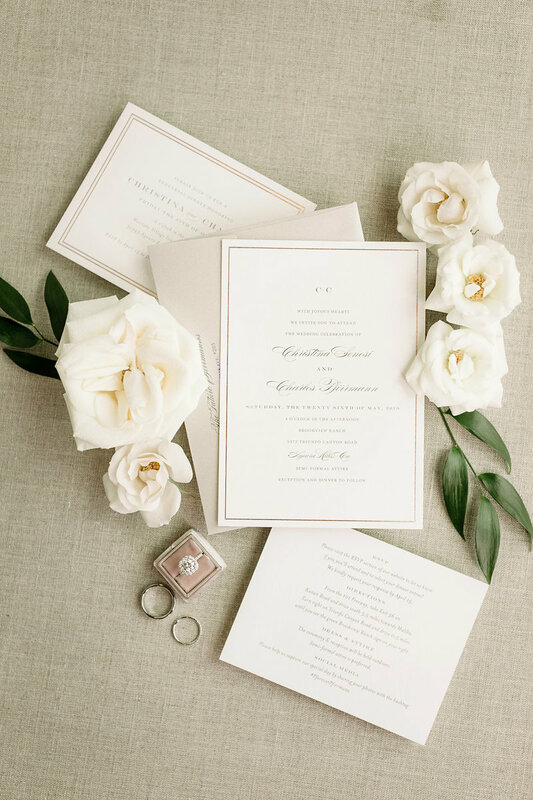 Their design palate was based on neutral colors, timeless design and sophistication. 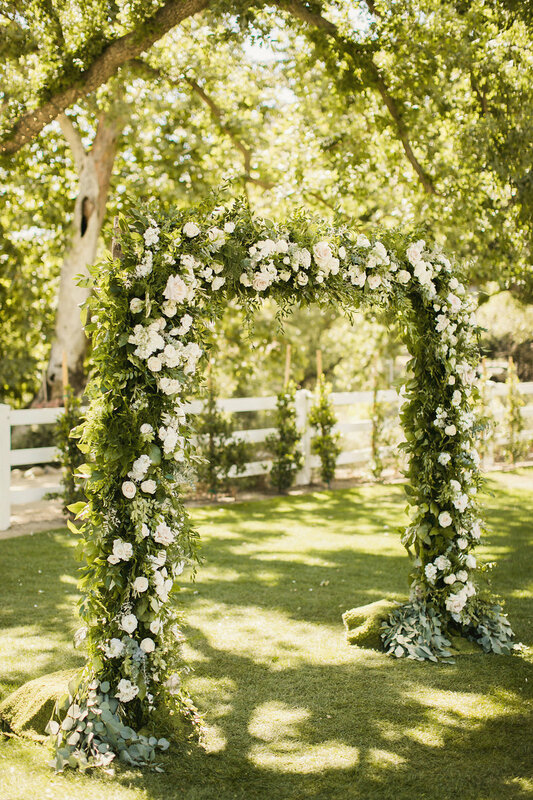 We think this is one Pinterest perfect album! 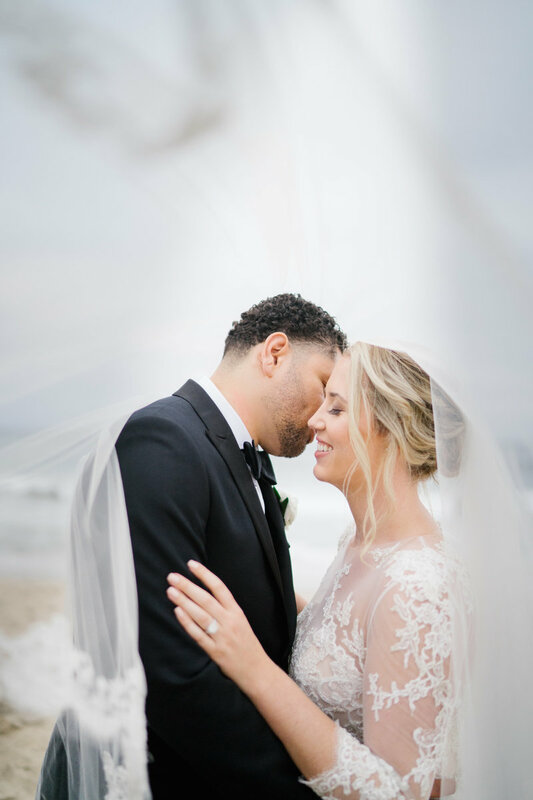 Mary & Edison love the ocean (& their Duffy!) 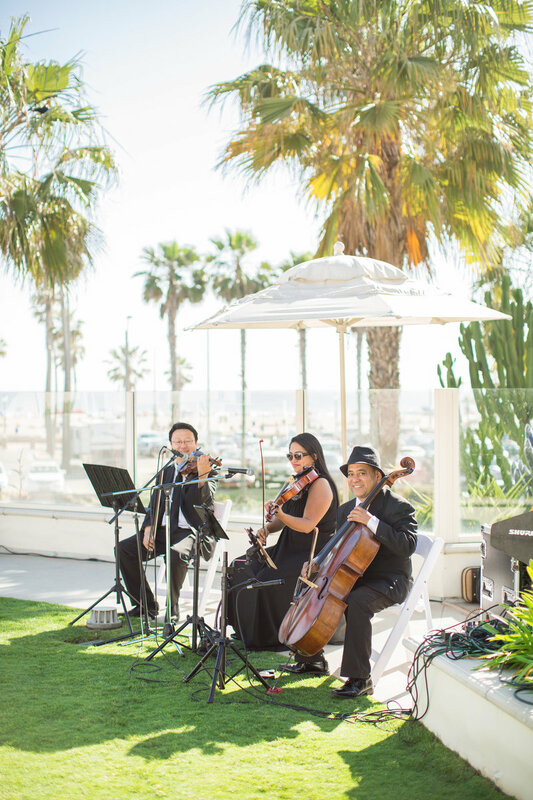 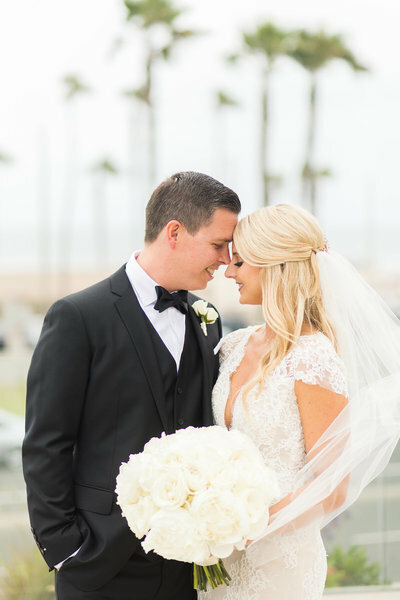 so it was only fitting to have their special day be at an amazing coastal wedding venue in Huntington Beach. 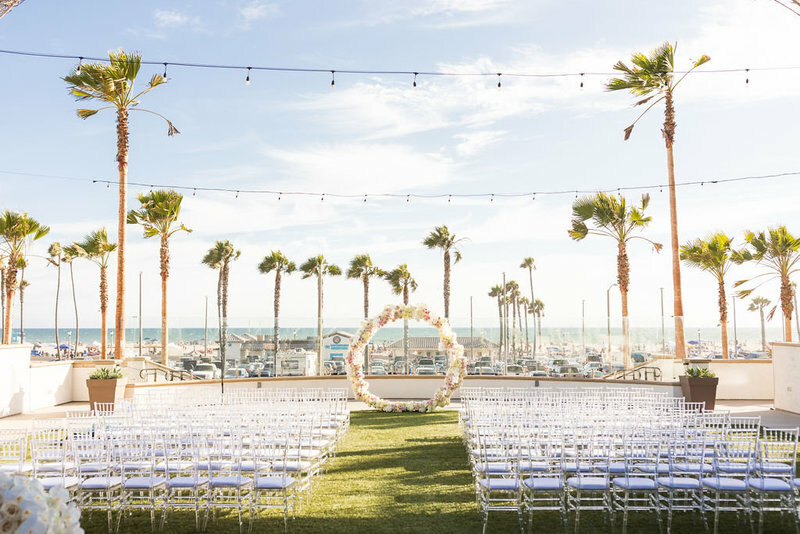 The view alone was breathtaking but then bring in the impeccable design and you have the perfect setting. 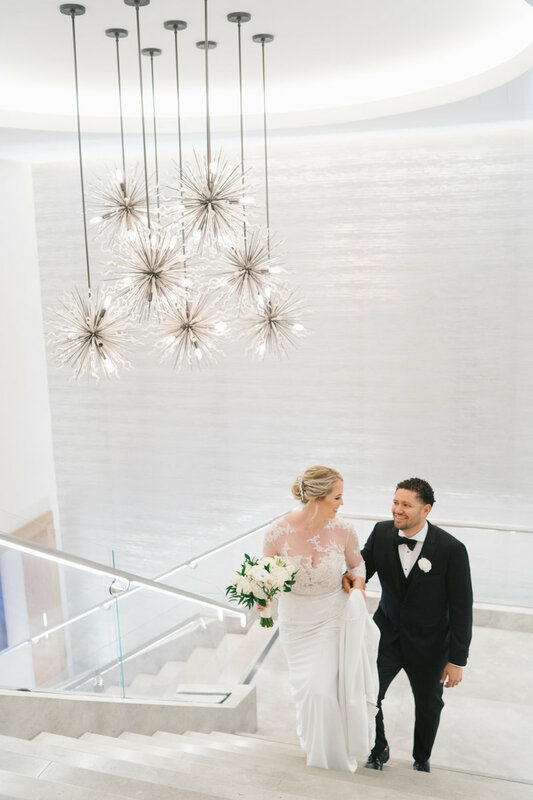 Mary wanted to make sure the overall day was relaxed but with a hint of luxury and they nailed it! 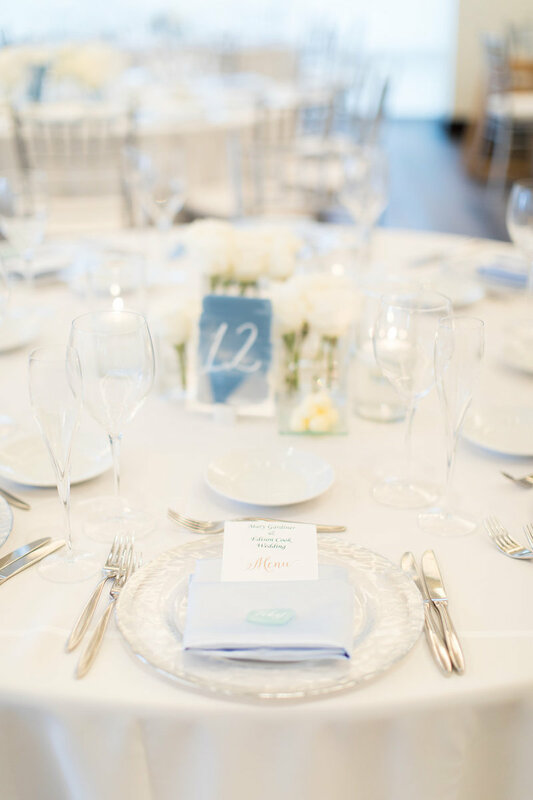 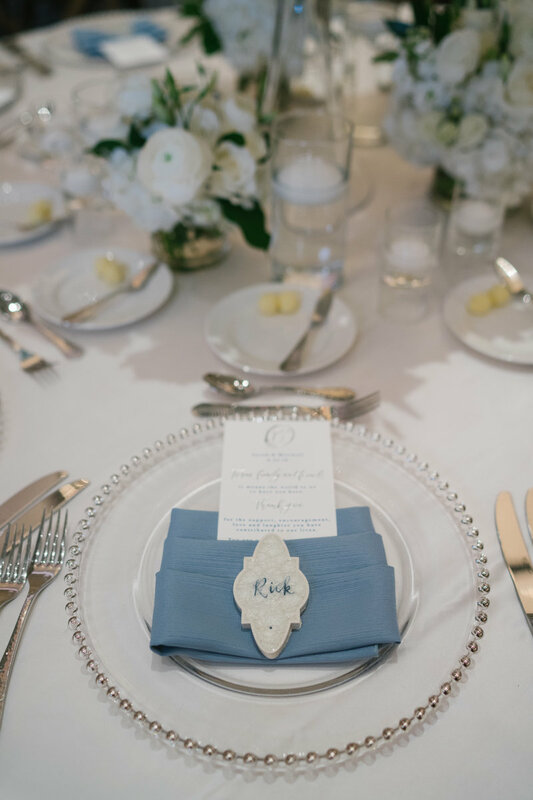 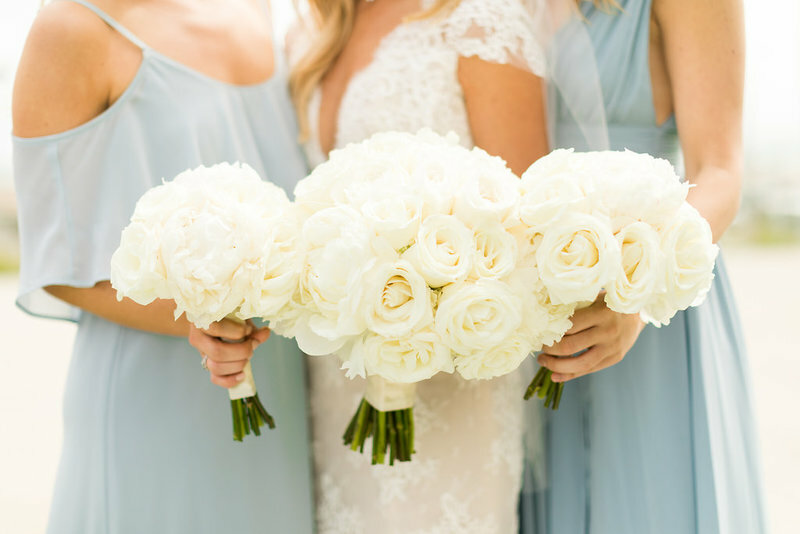 The soft blue hues paired with neutral tones created the most relaxing setting that we can't stop talking about. 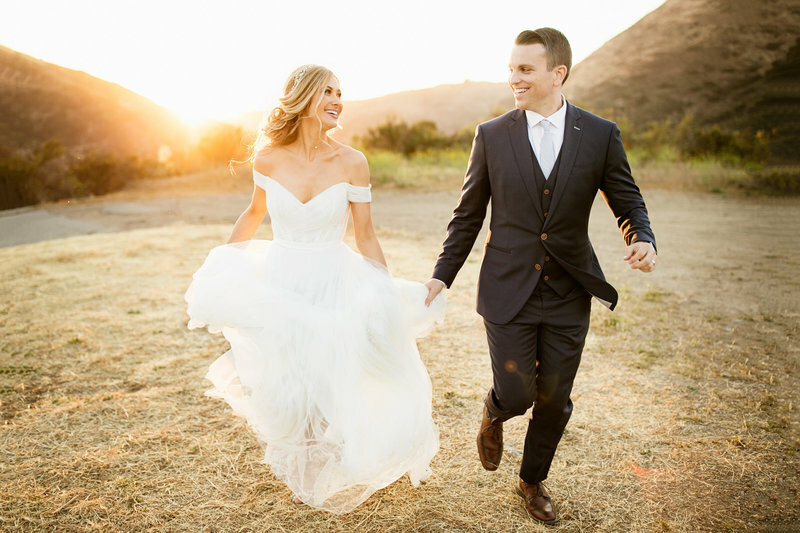 It might sound cliché but these two literally radiate happiness and so did their wedding day! 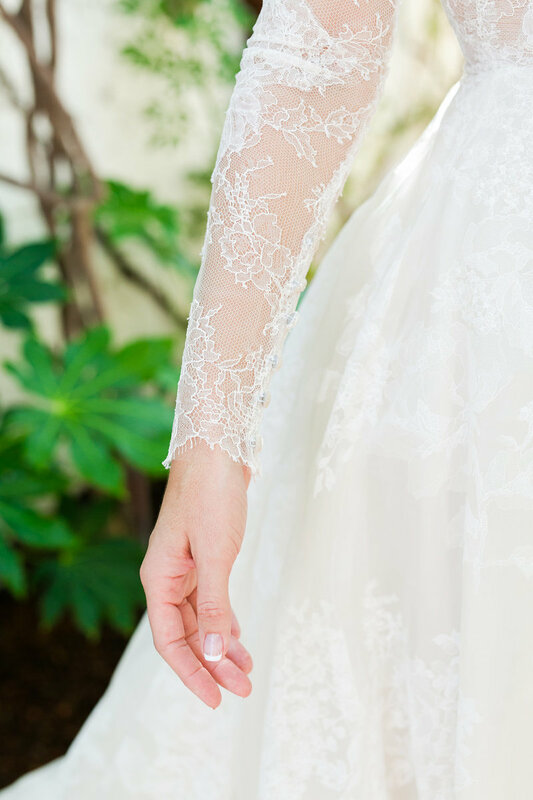 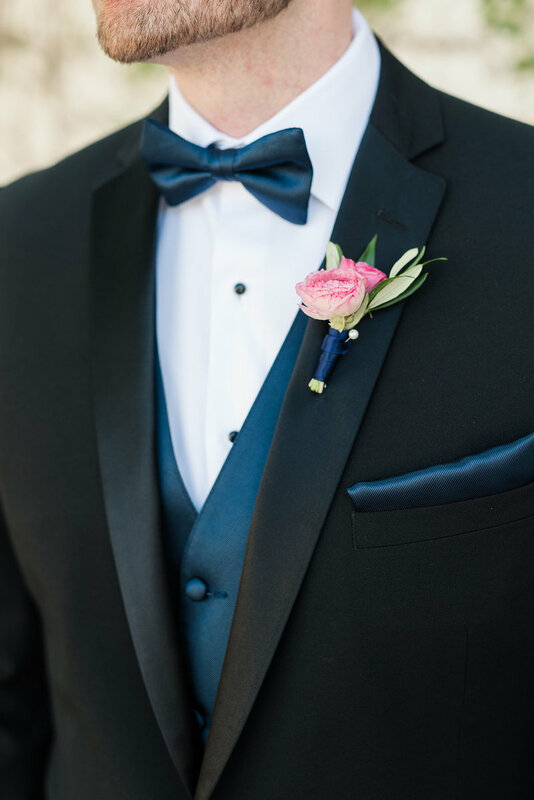 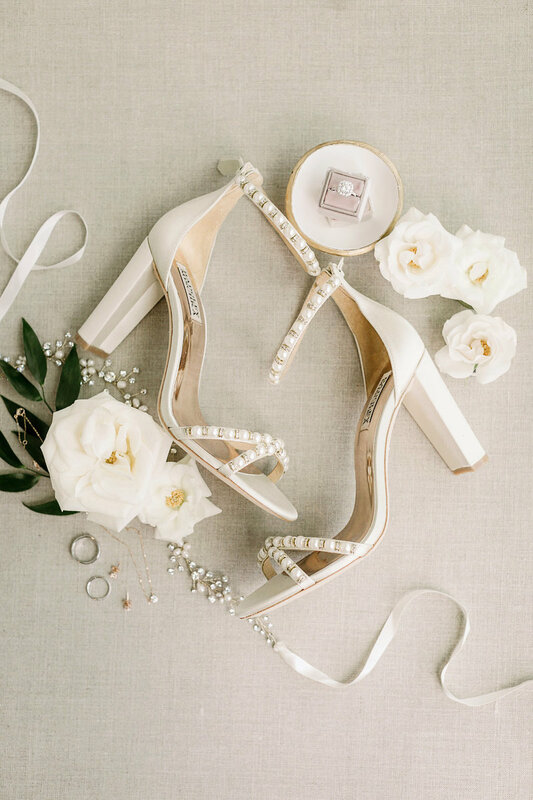 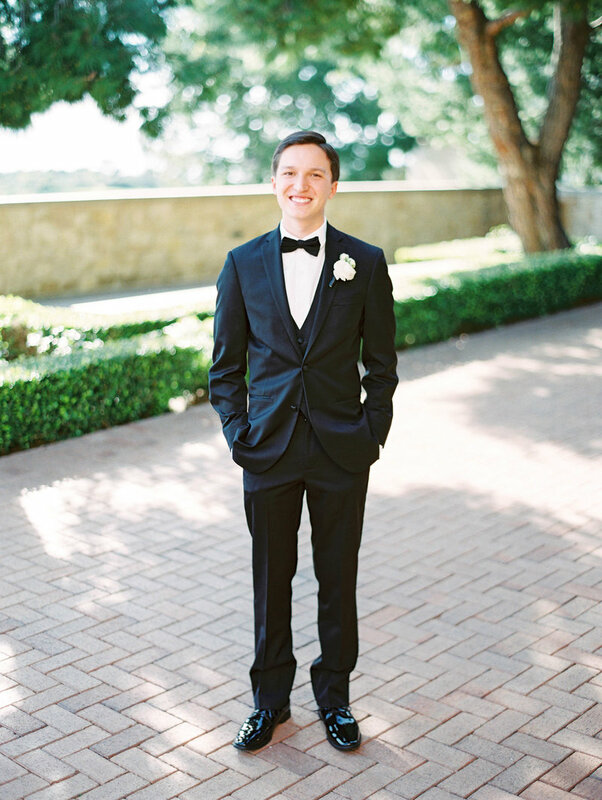 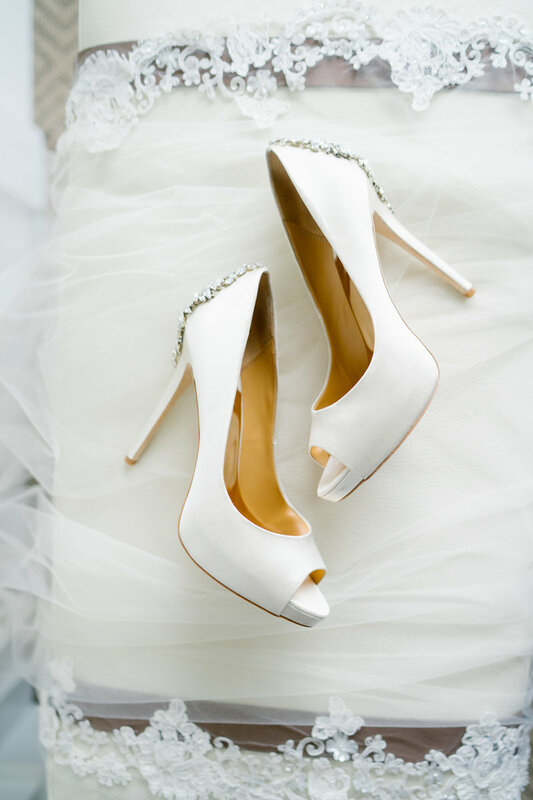 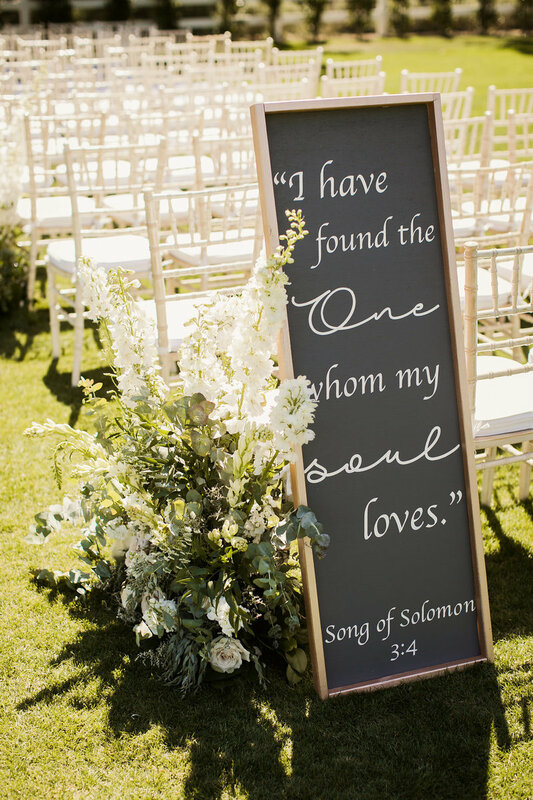 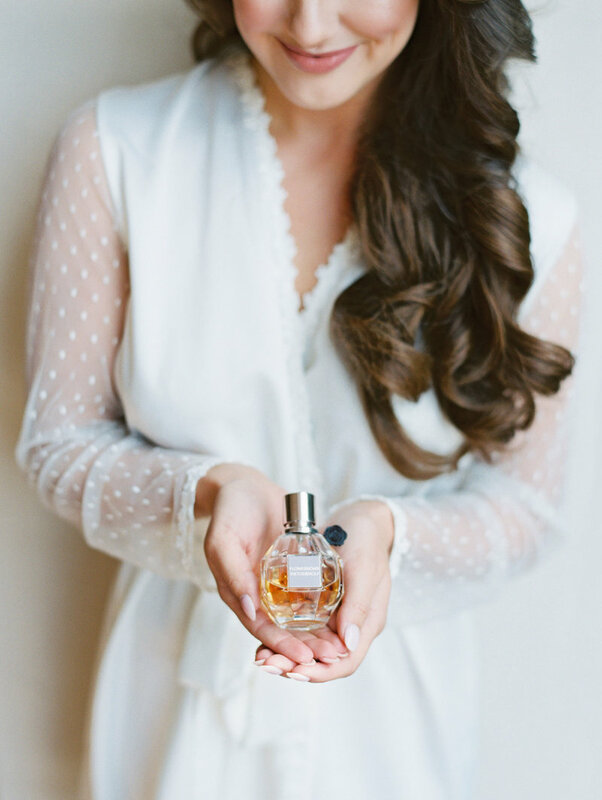 This swoon worthy wedding is sure to leave you inspired. 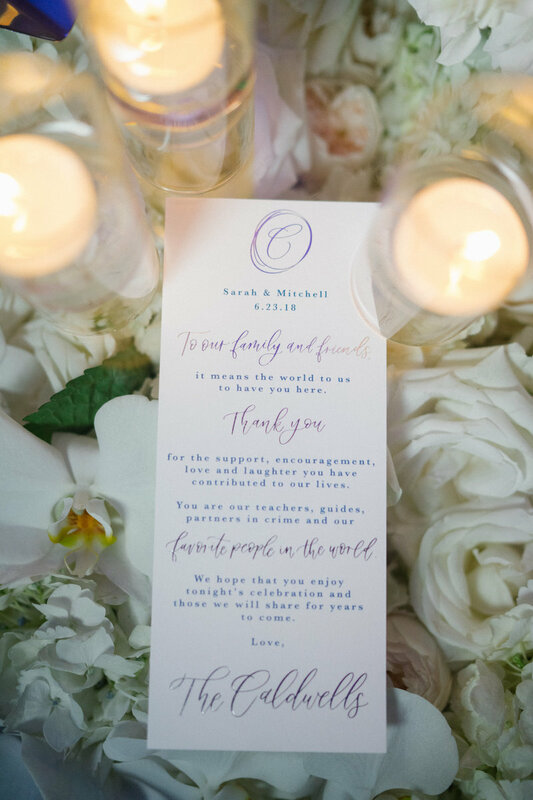 Christina & Charles thought of every little aspect of their wedding day and not one detail was missed. 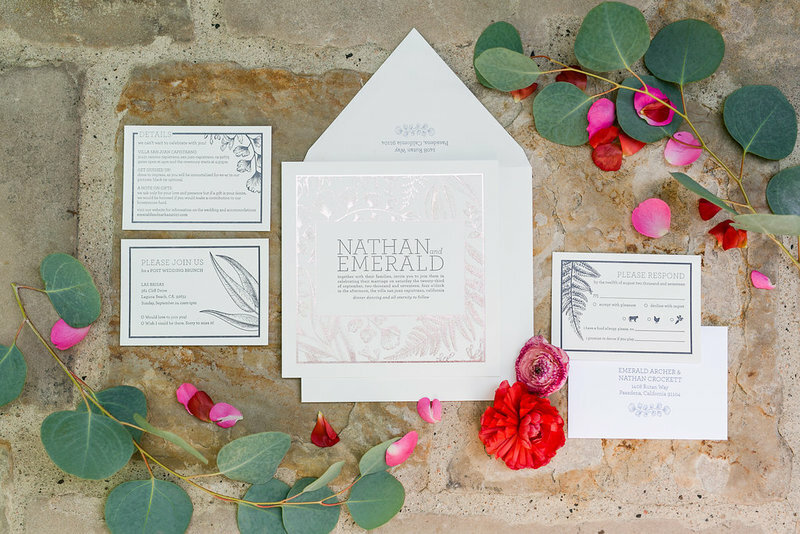 This wedding was one of our favorite designs of the year. 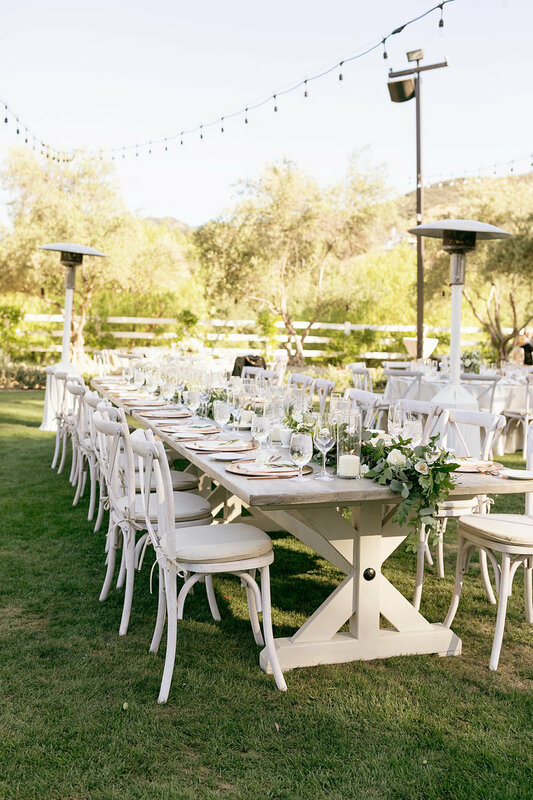 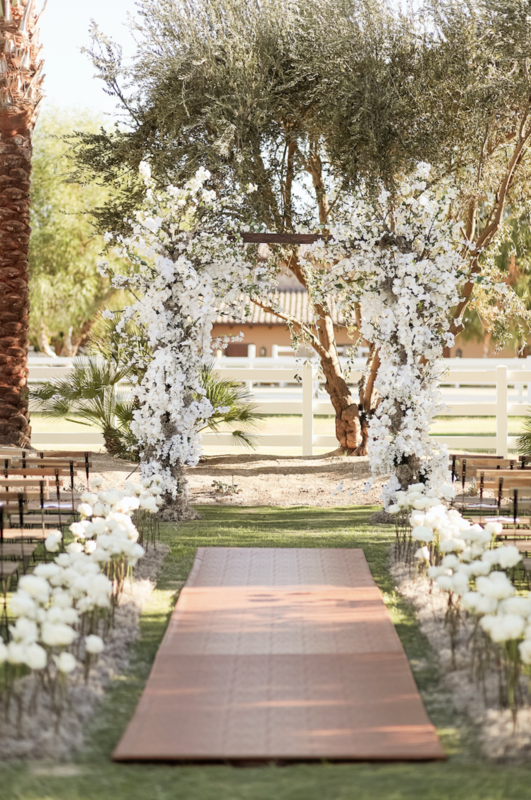 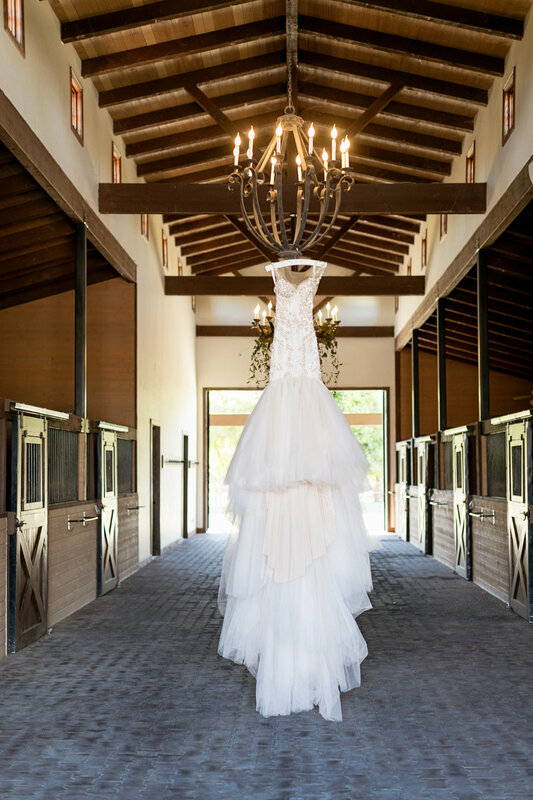 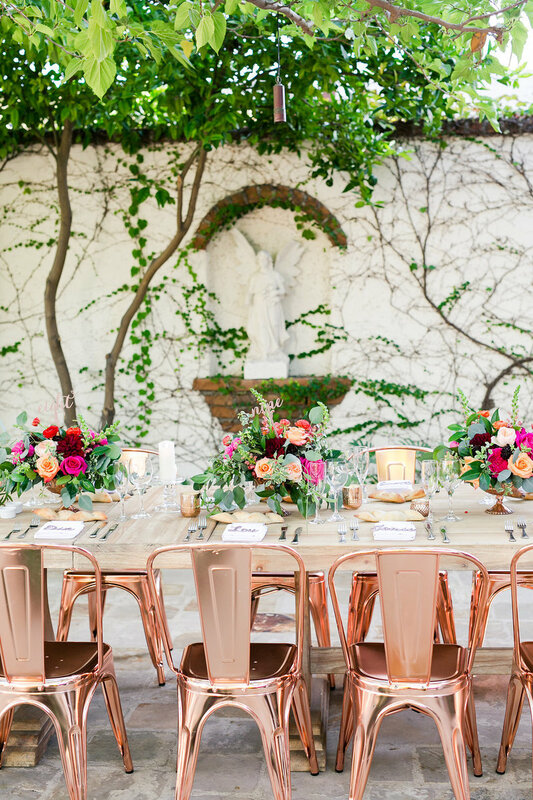 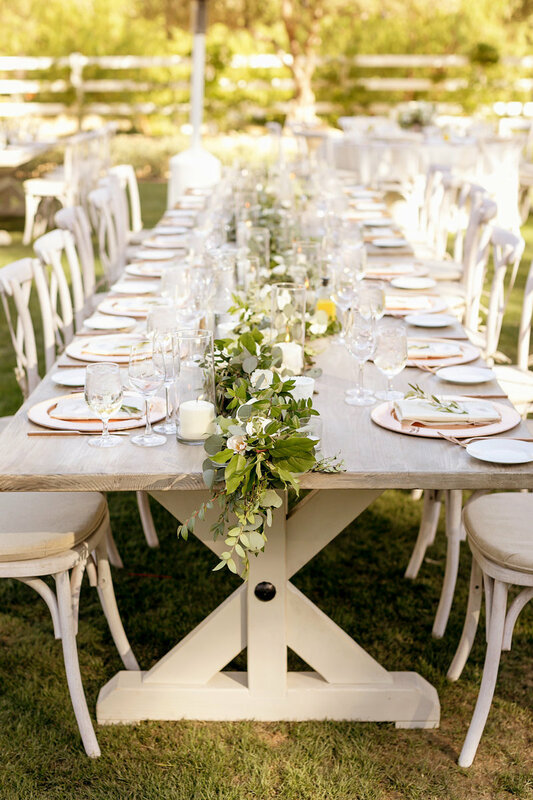 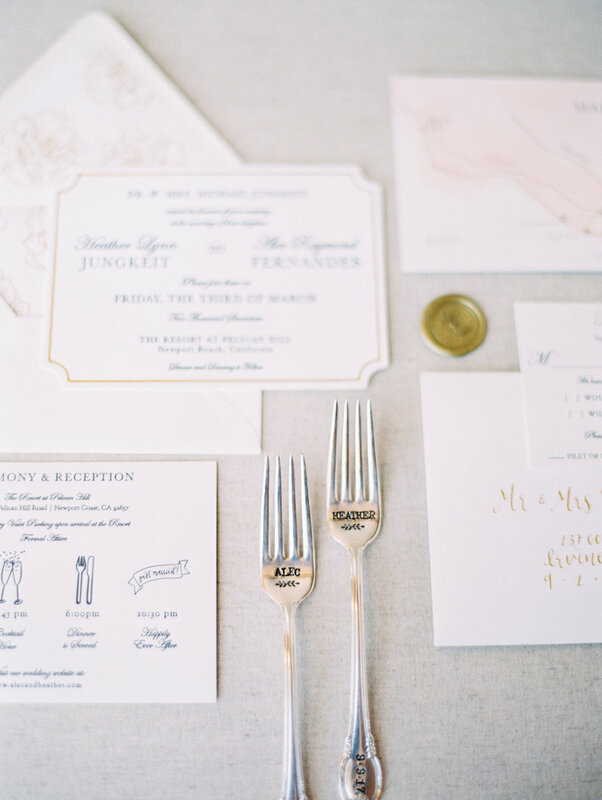 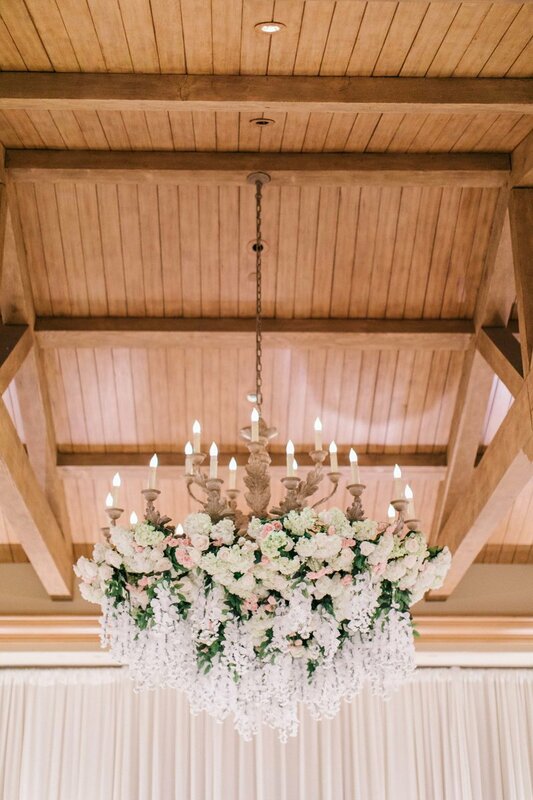 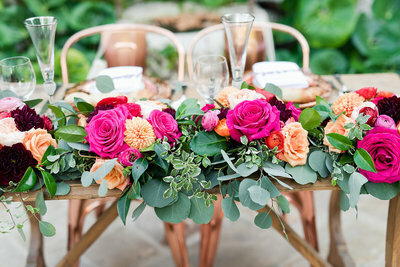 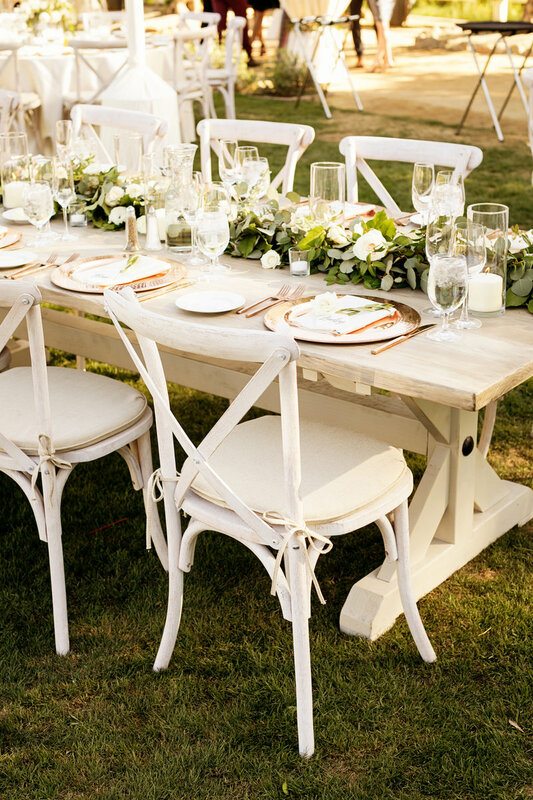 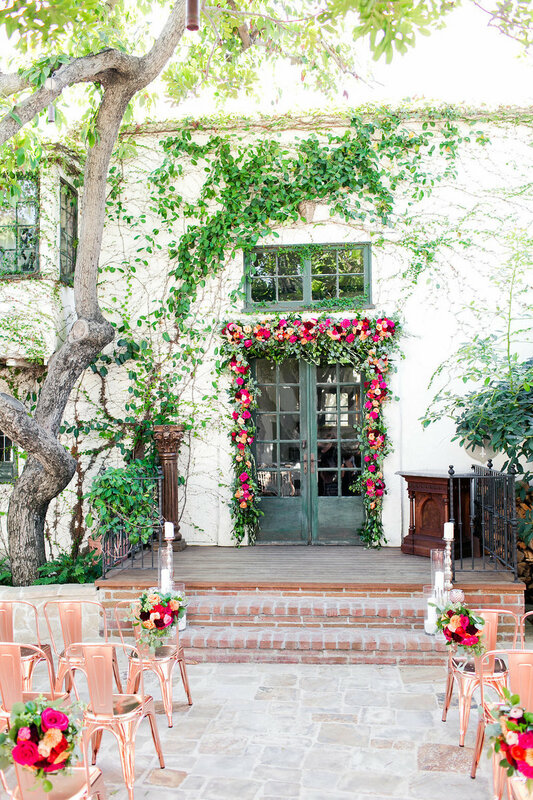 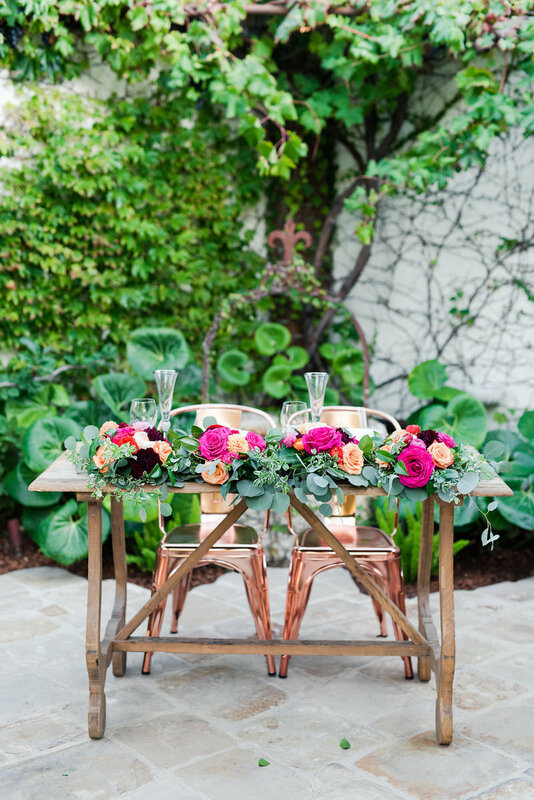 It was so organic and chic which brought Brookview Ranch to life! 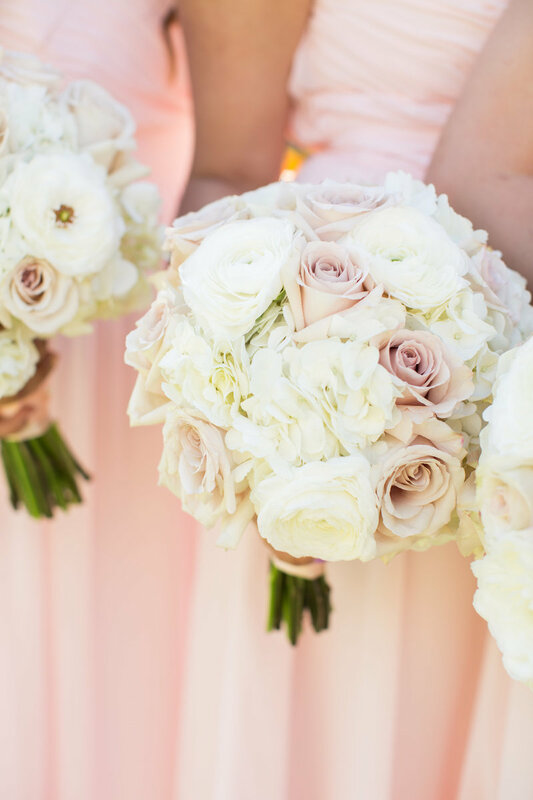 There wasn't one specific detail we didn't fall in love with and we know you will too! 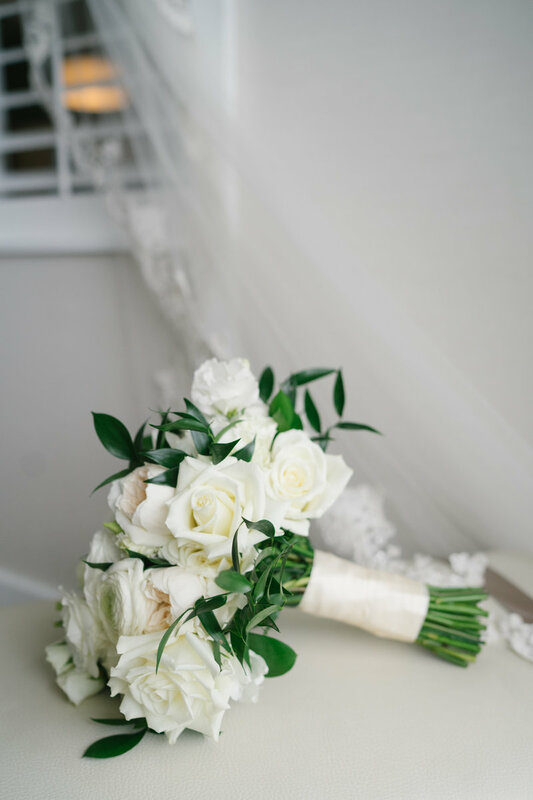 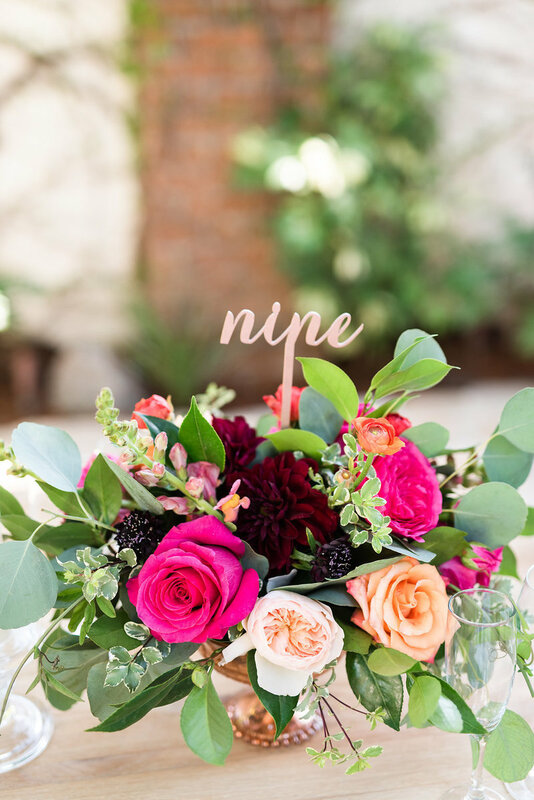 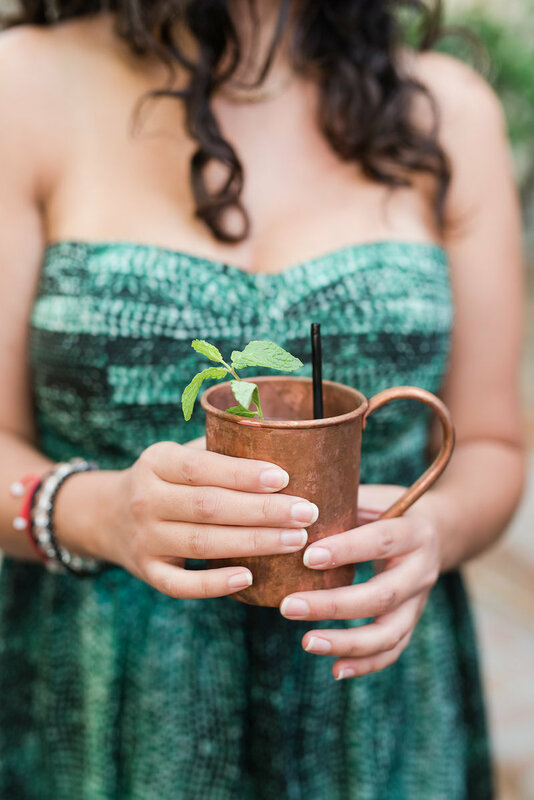 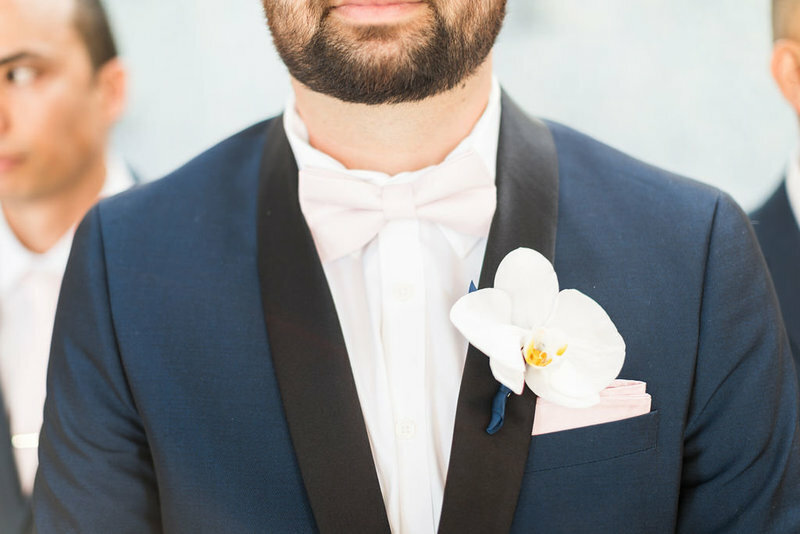 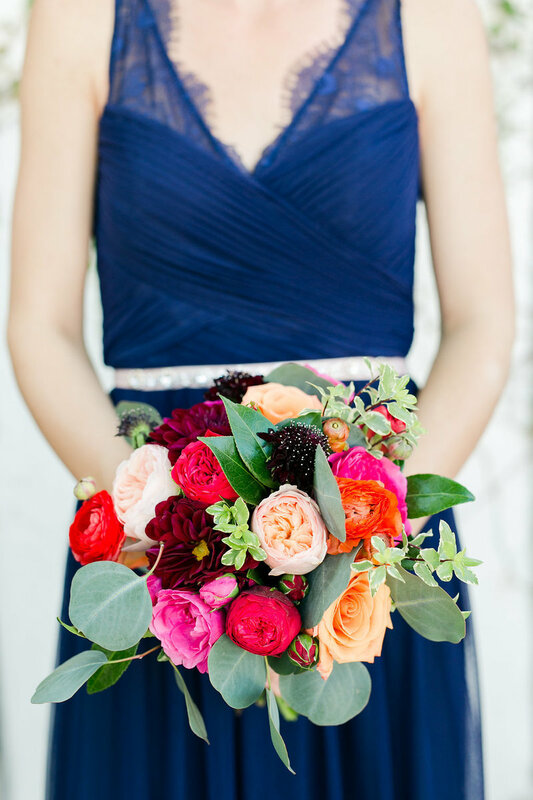 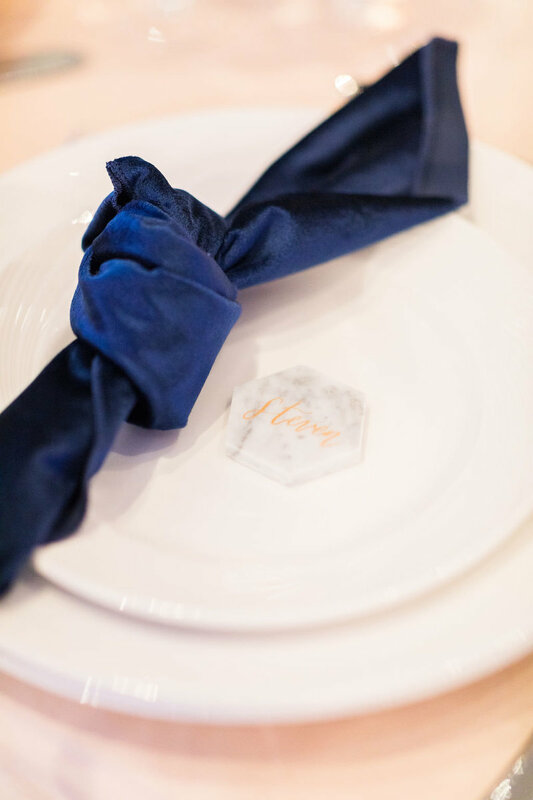 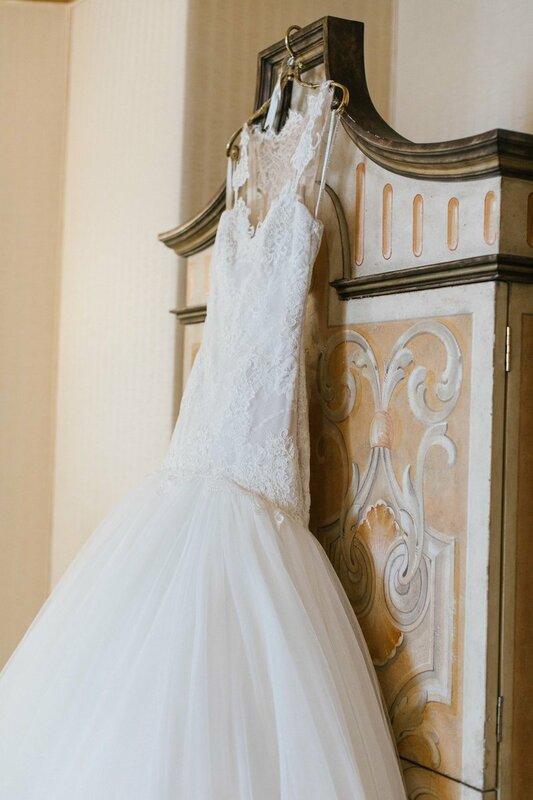 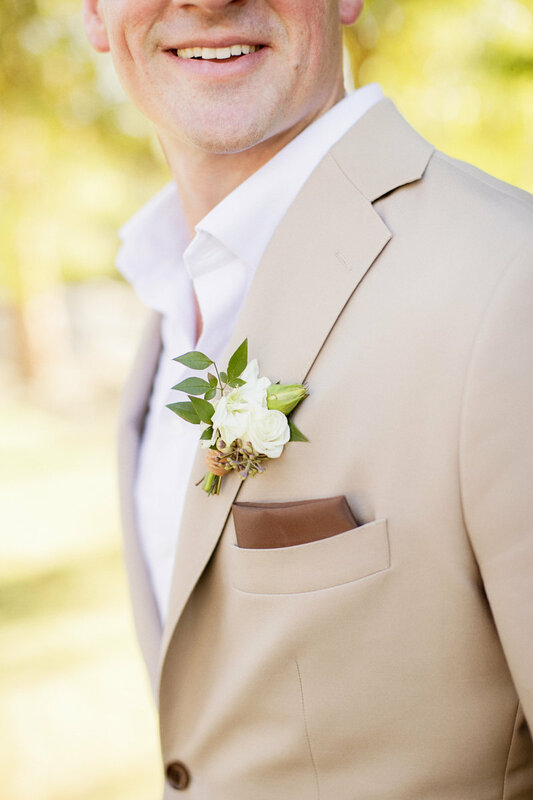 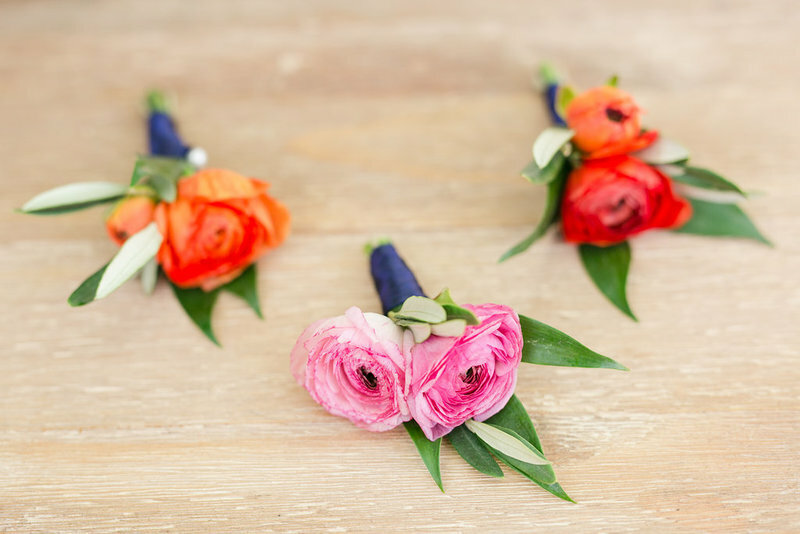 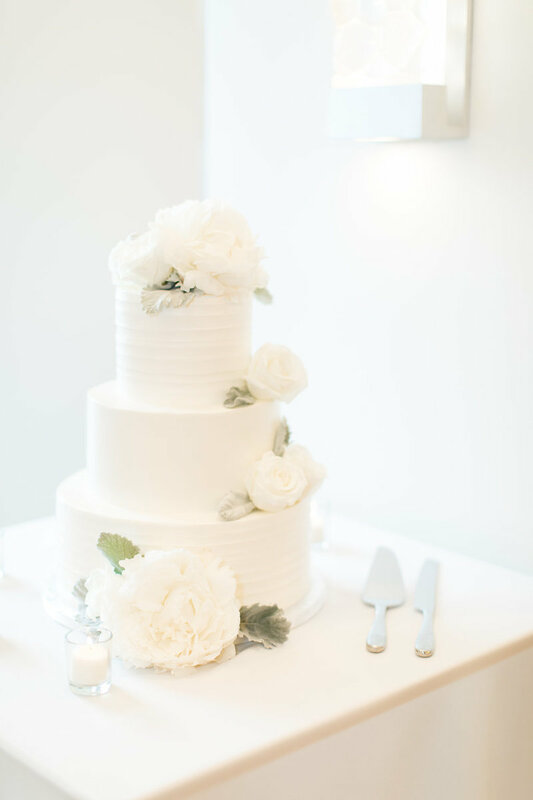 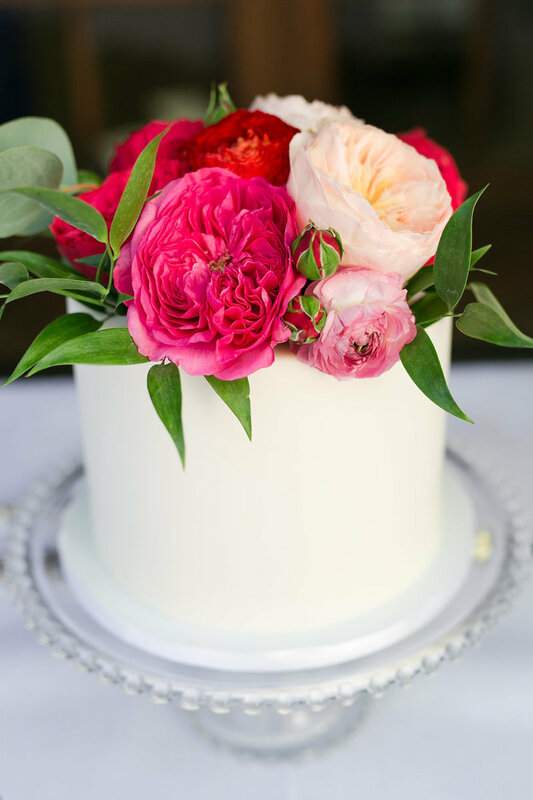 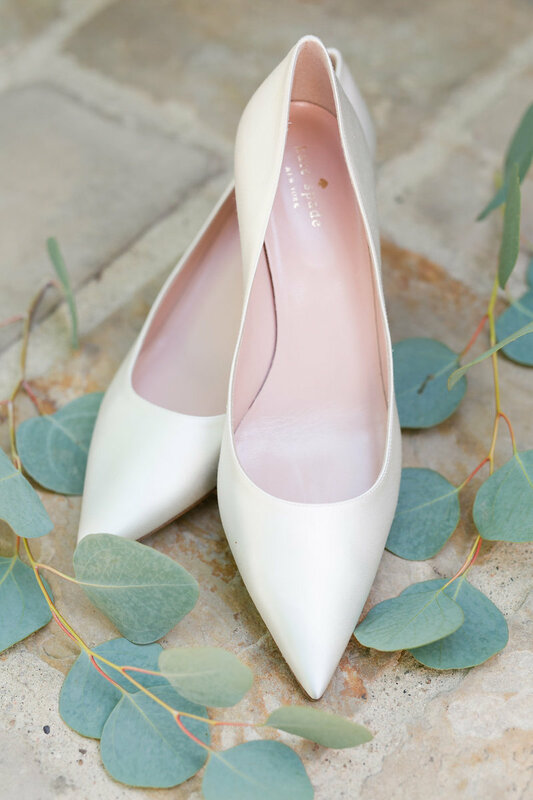 No folks, this wedding wasn’t a styled shoot! 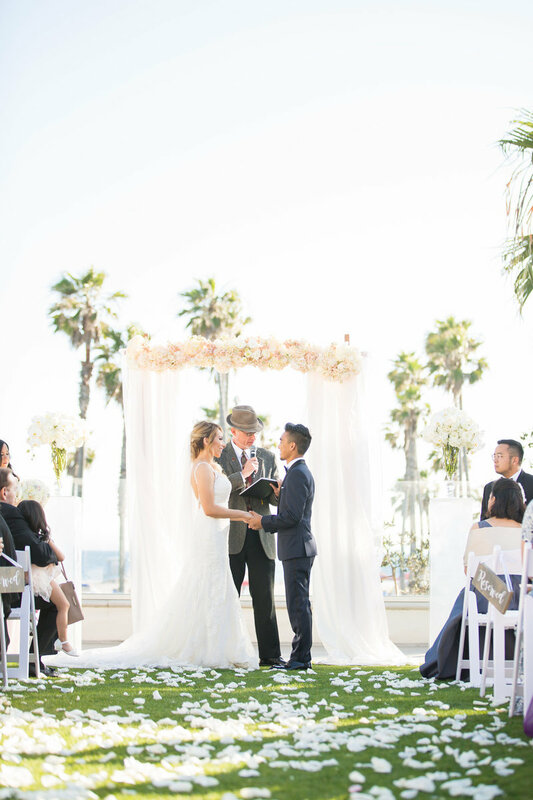 It is a REAL wedding! 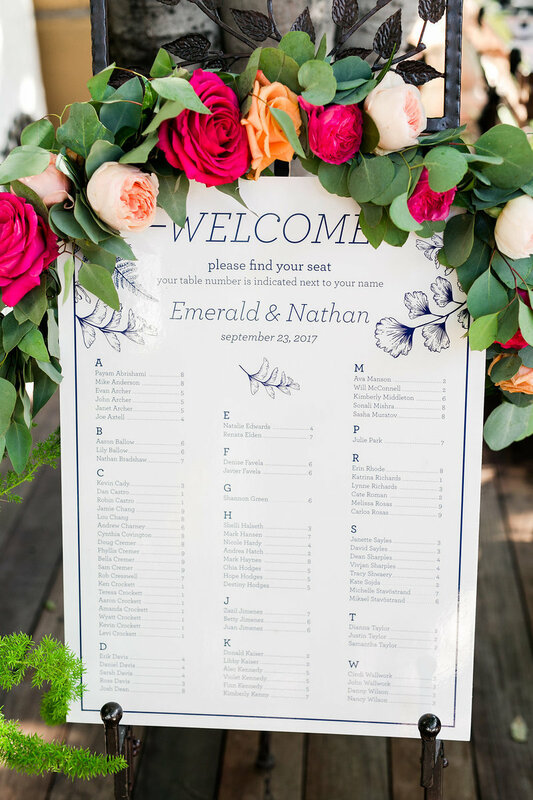 Emerald and our designer, Lauren sure didn’t miss a single element. 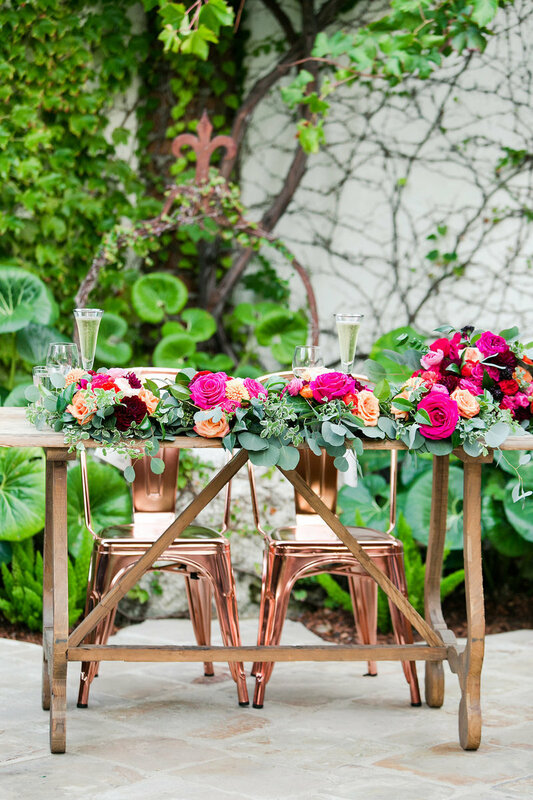 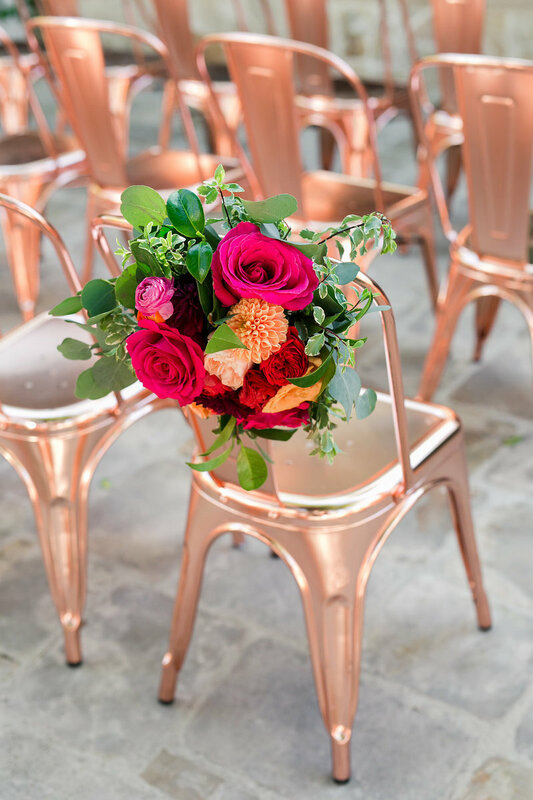 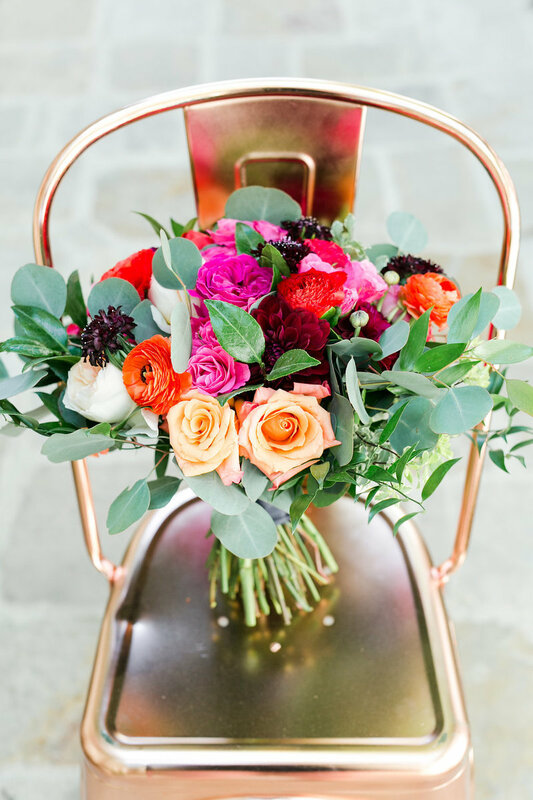 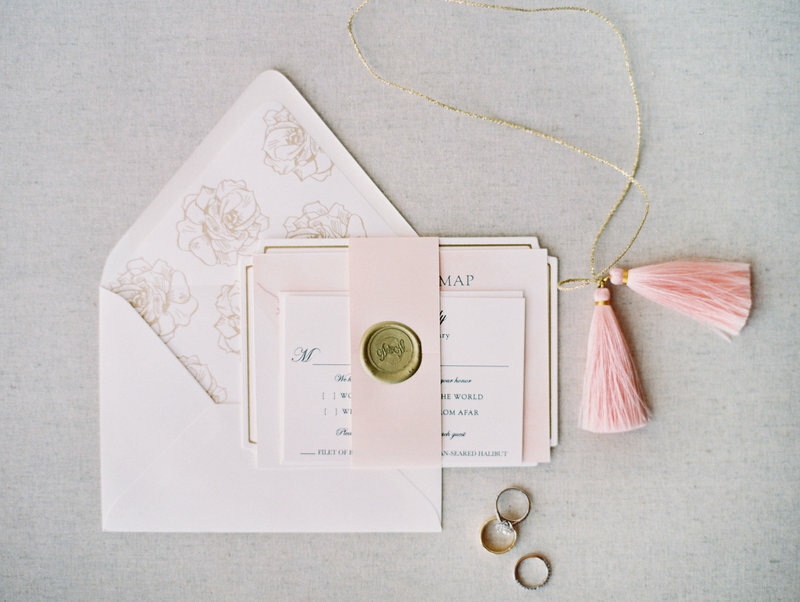 The vibrant palette with mixed metals just makes your heart smile! 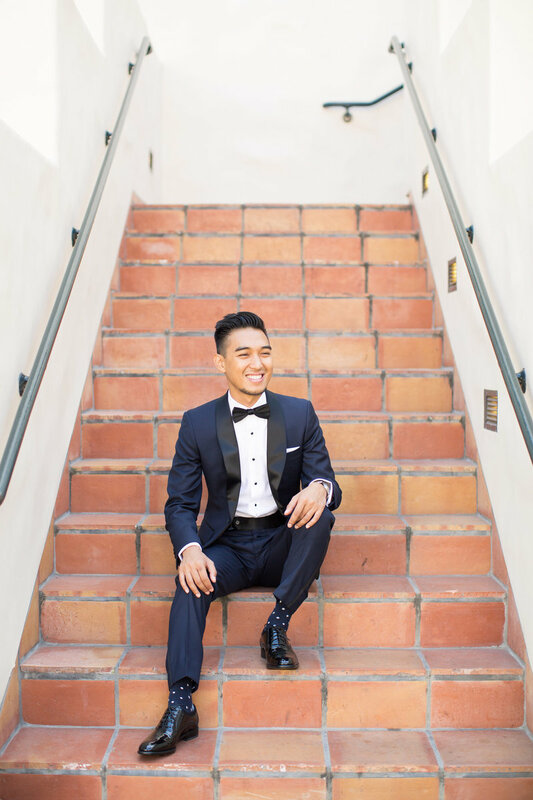 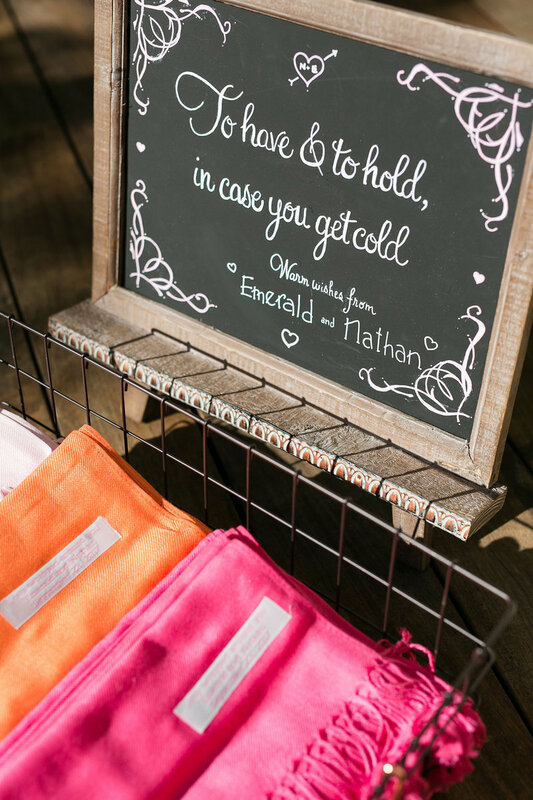 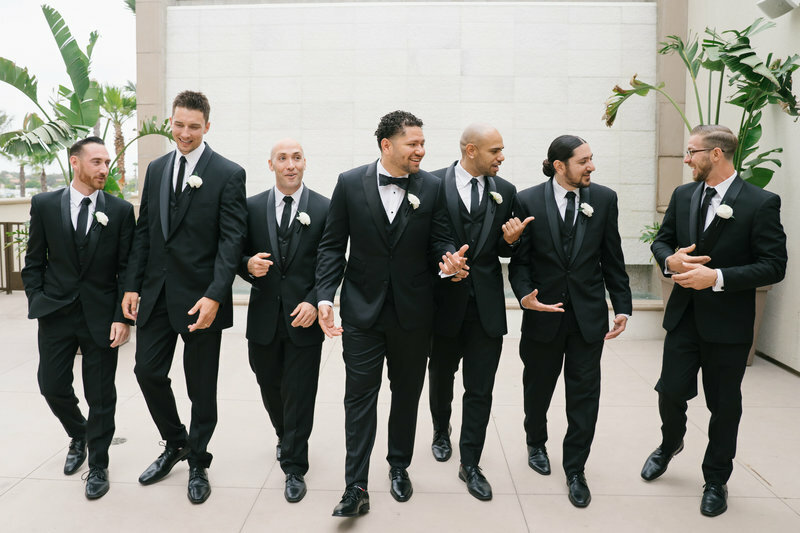 The bright colors and fun elements of this wedding day extends to Emerald & Nathan’s fun and outgoing personalities. 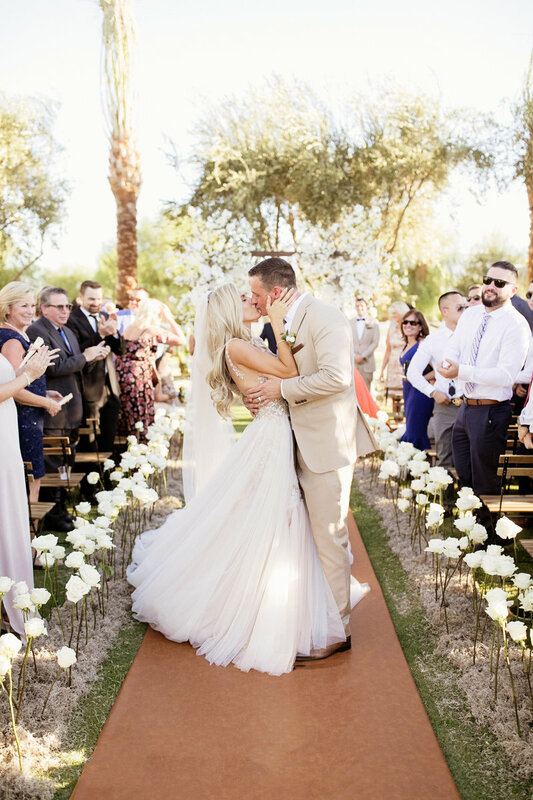 Surely this wedding is nothing short of perfection! 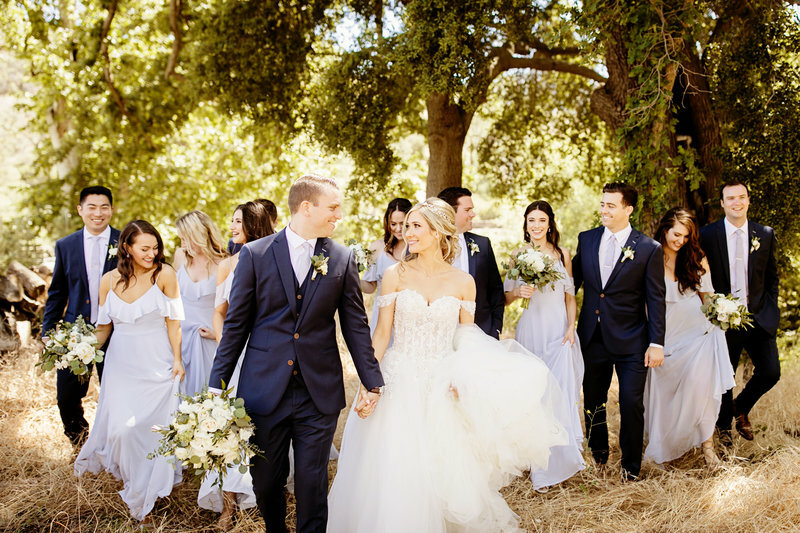 We just loved planning alongside Greer & Derek. 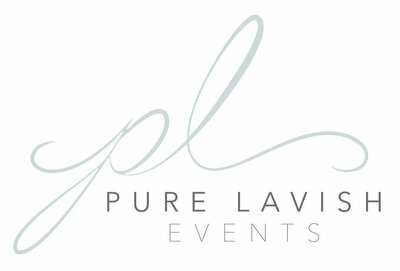 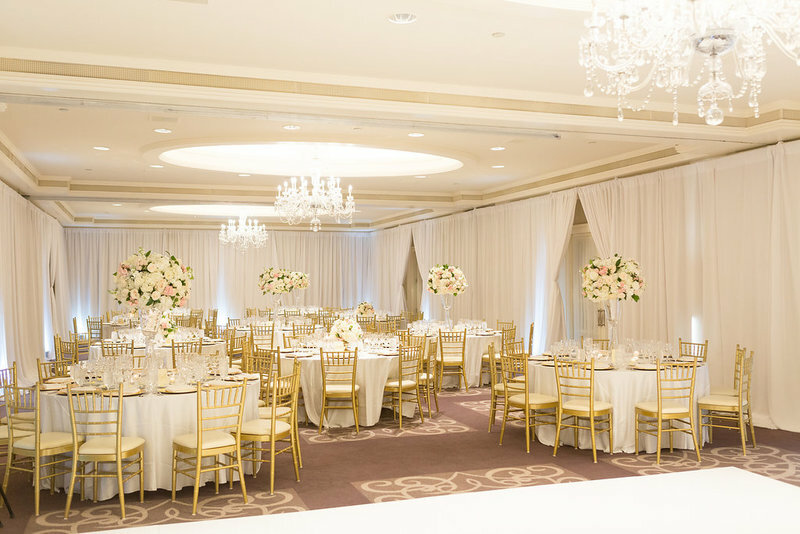 Their overall vision was classic, glamorous, and clean and they surpassed that vision with flying colors. 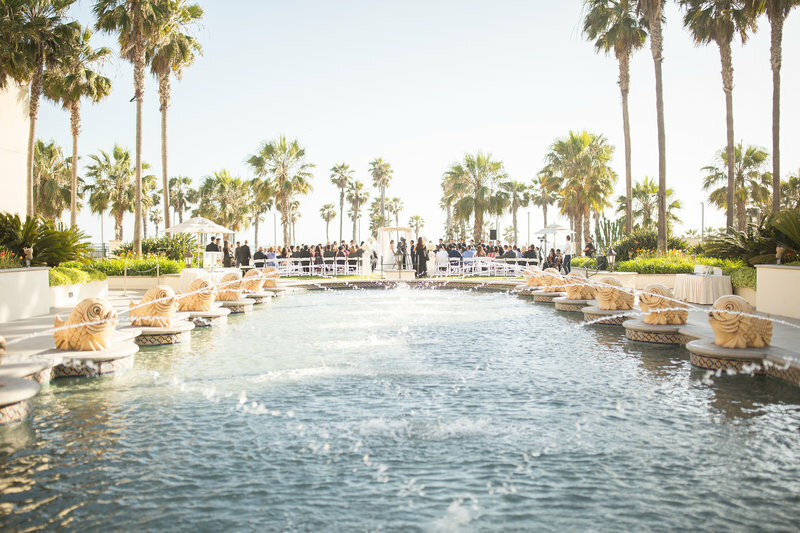 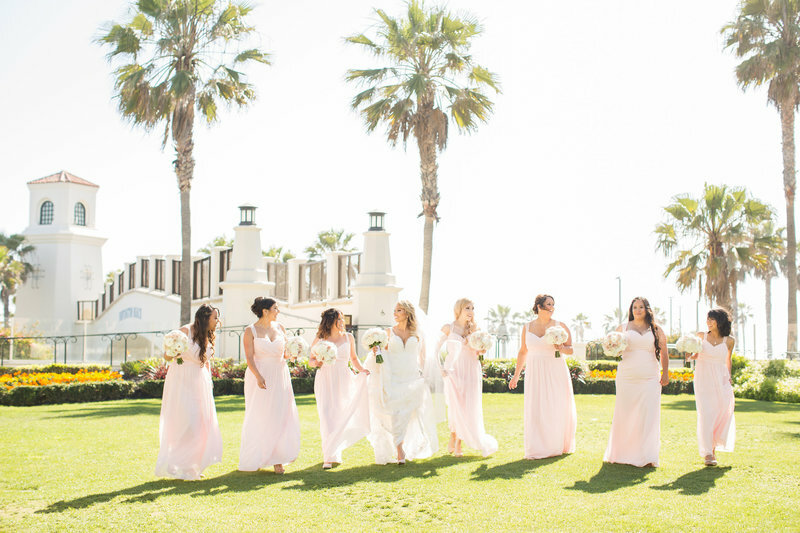 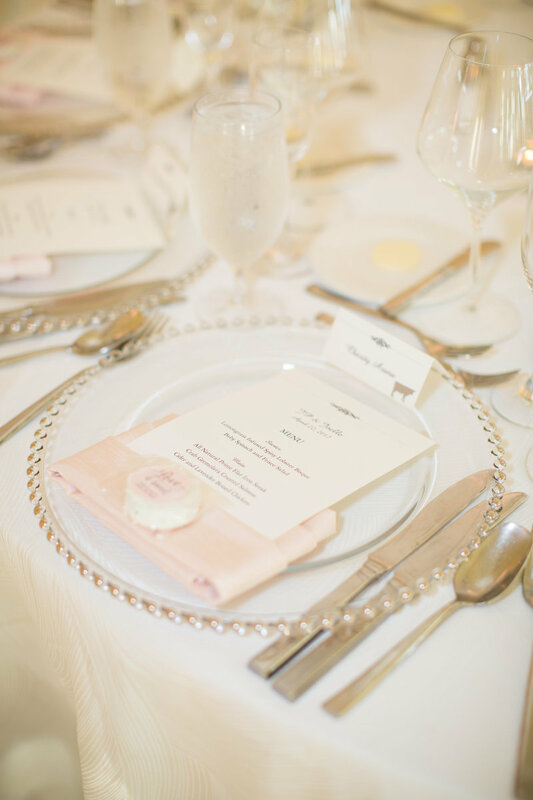 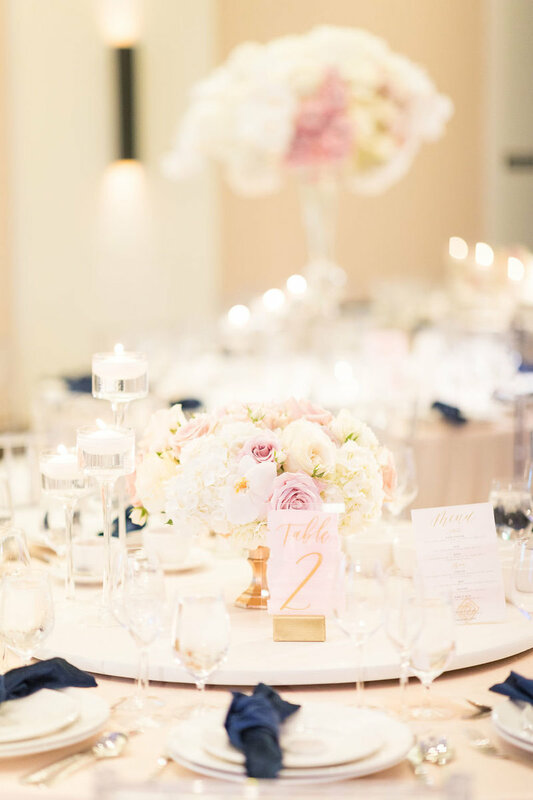 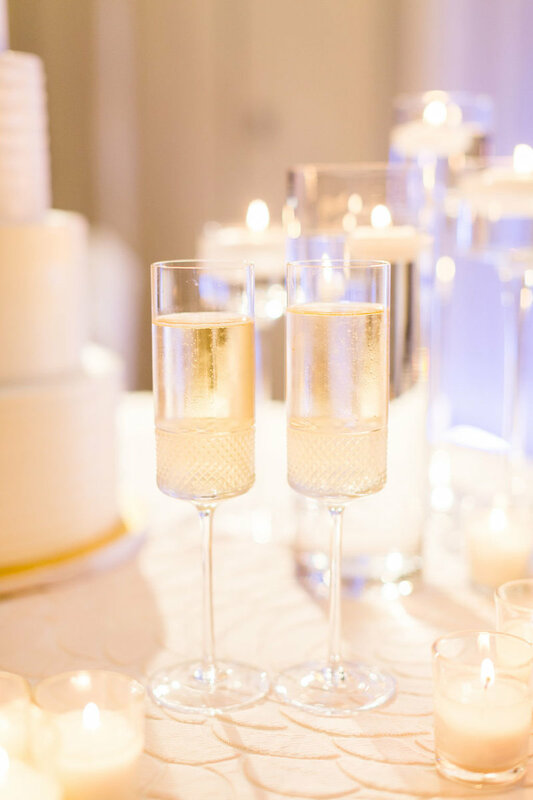 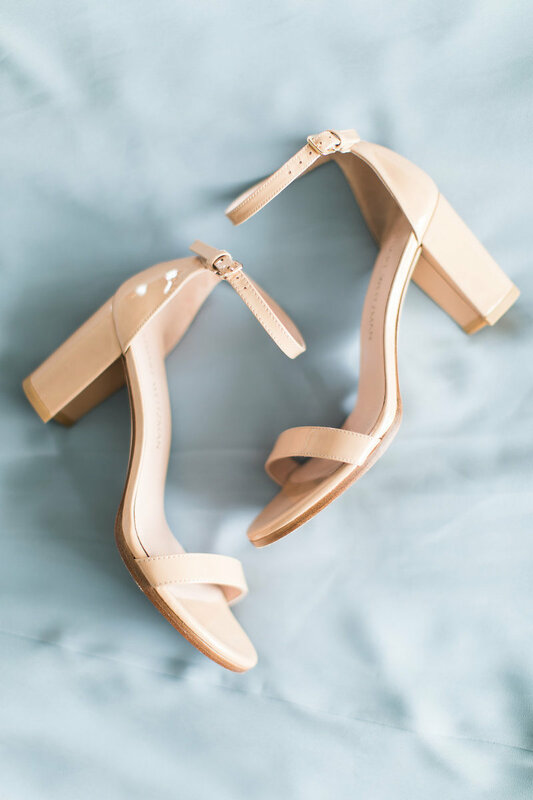 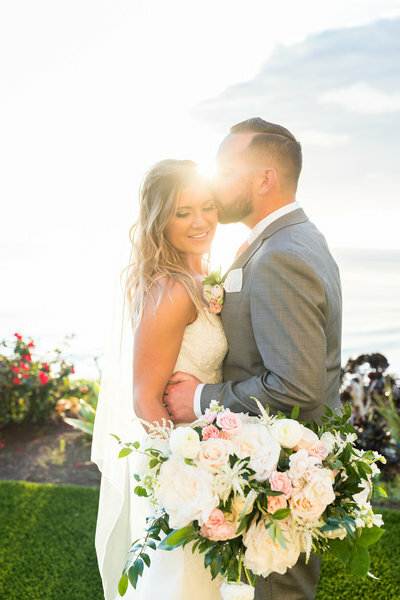 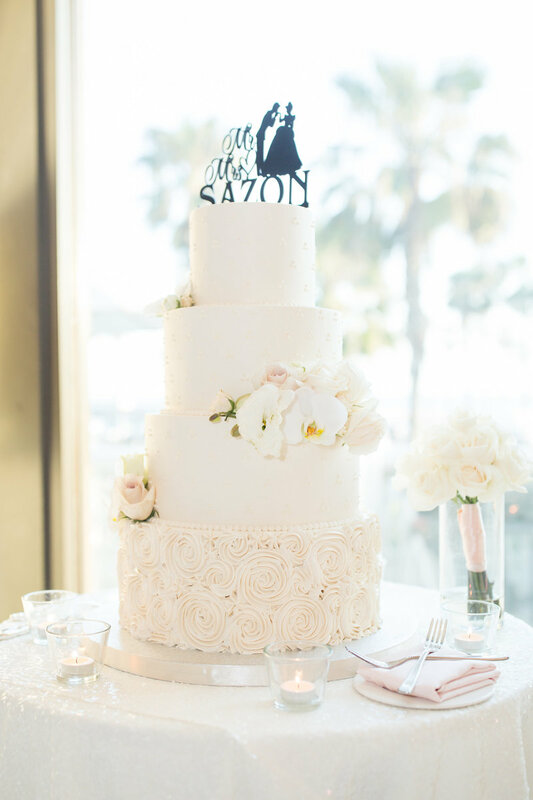 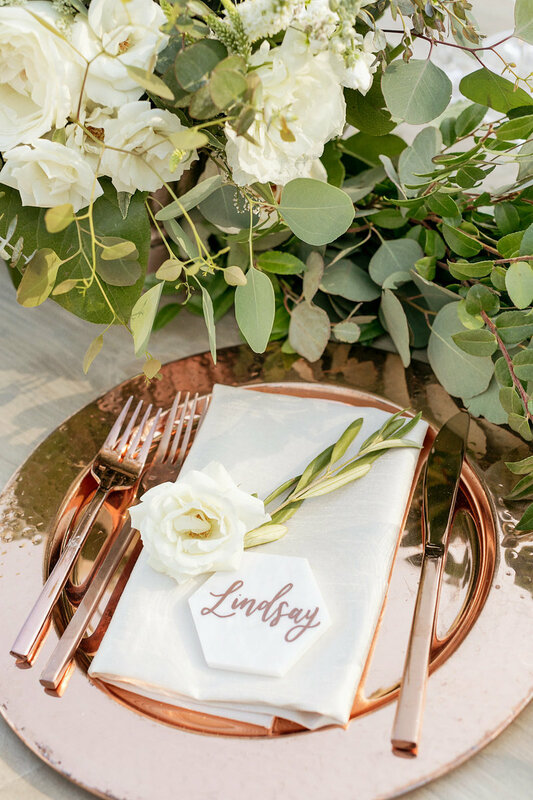 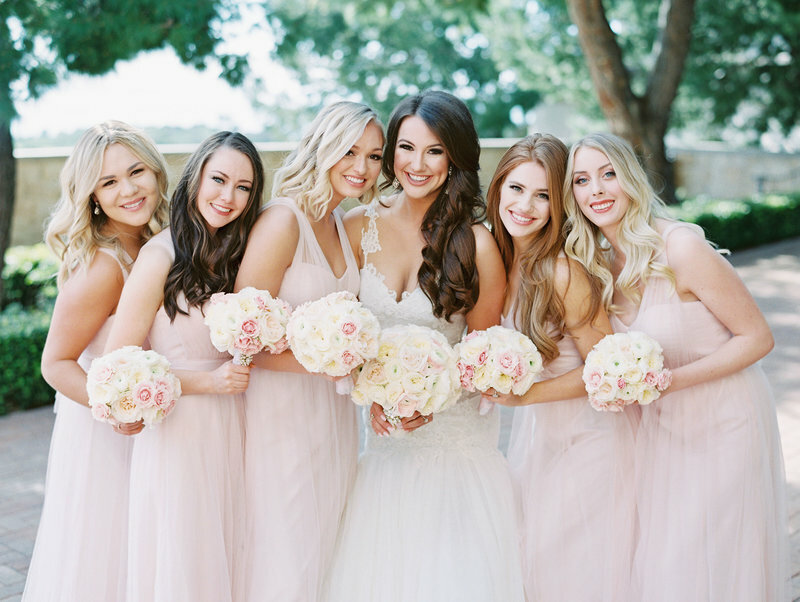 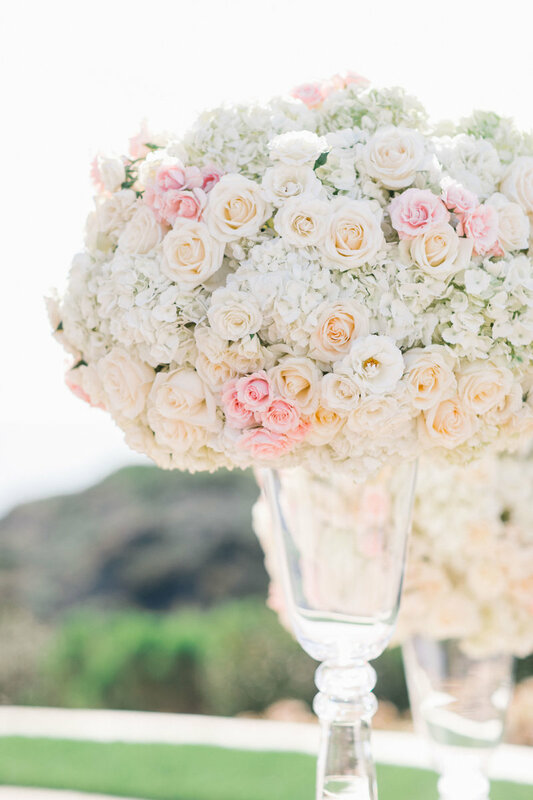 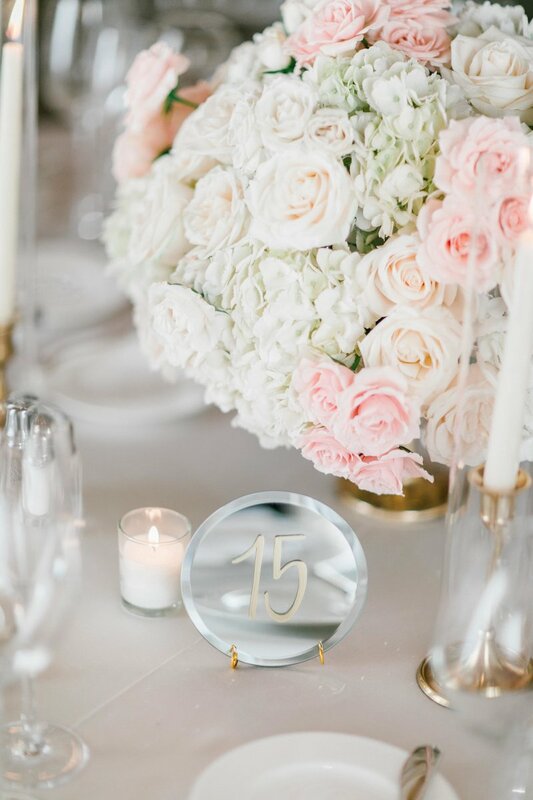 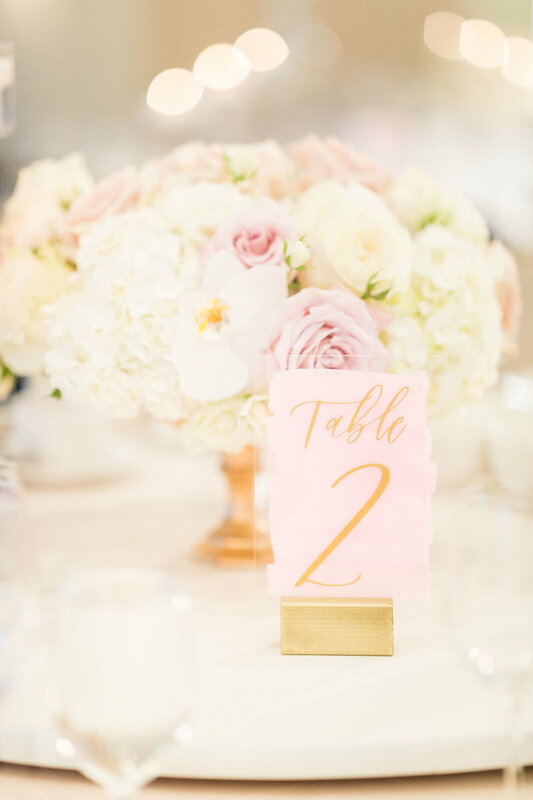 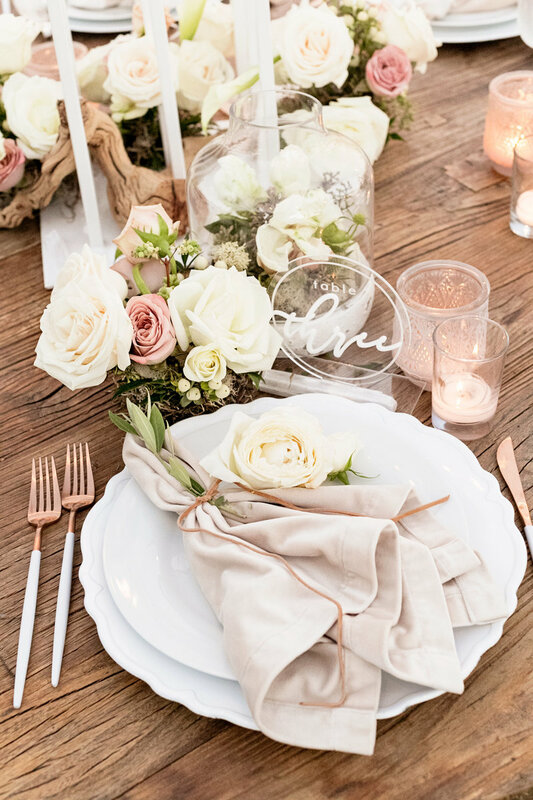 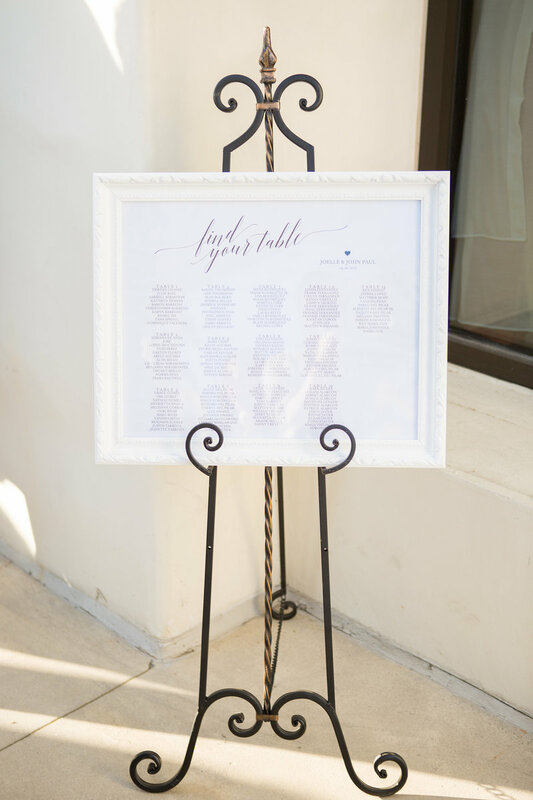 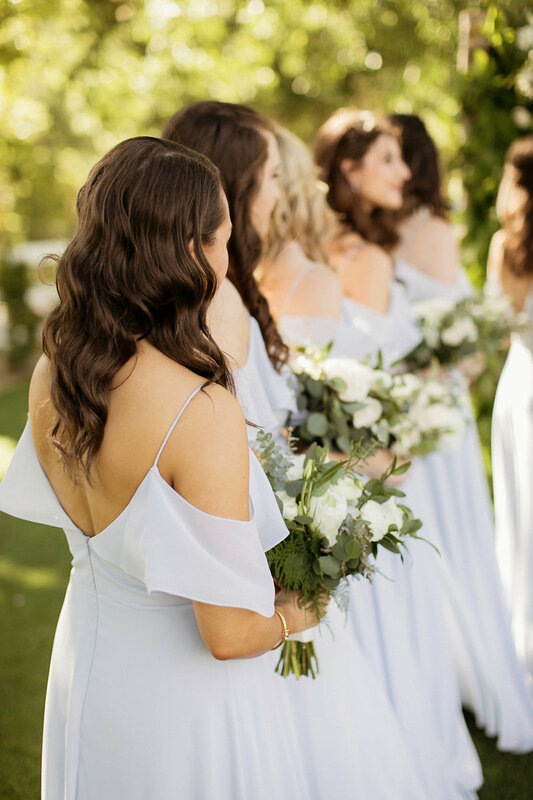 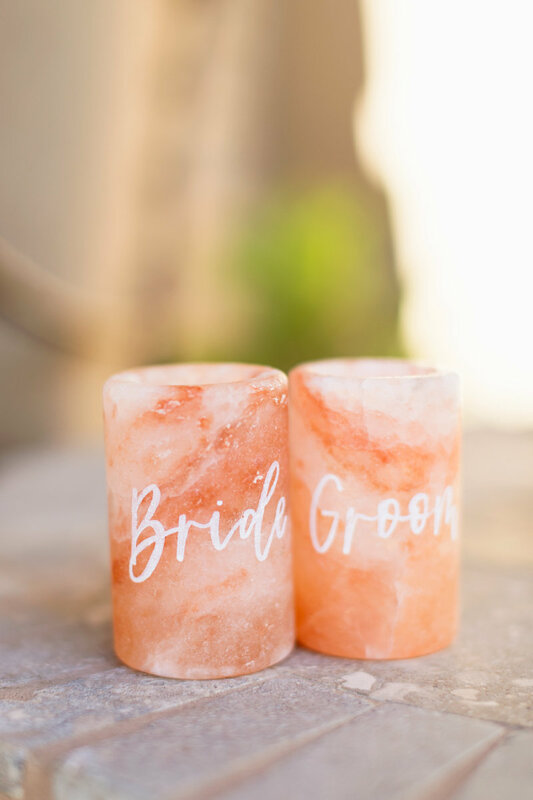 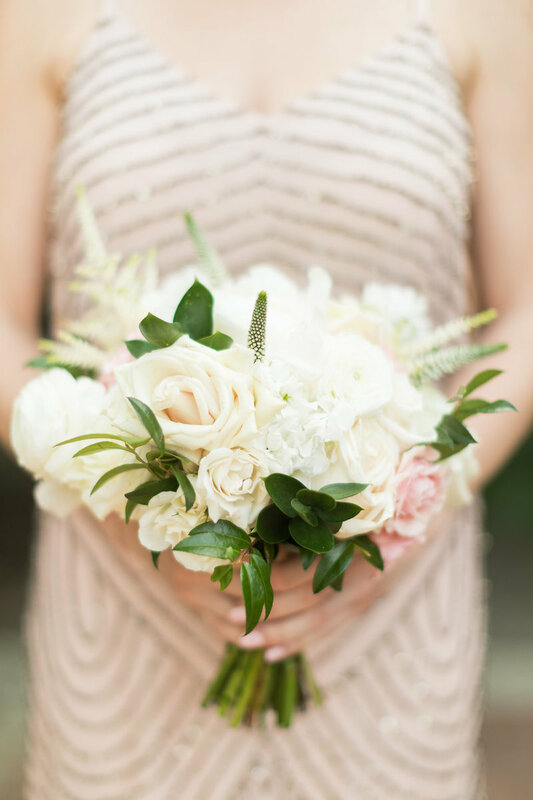 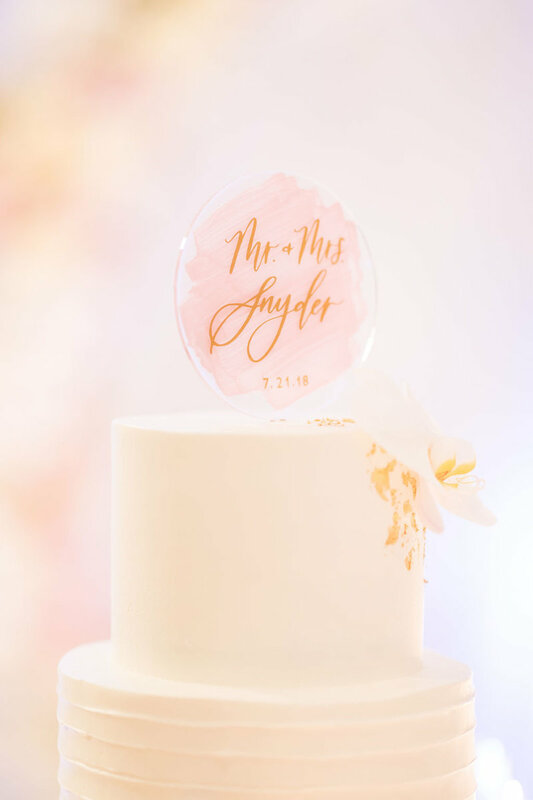 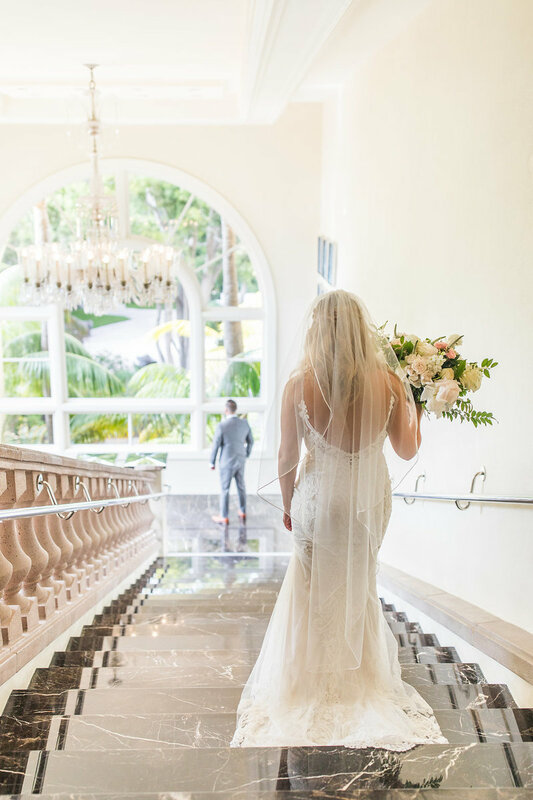 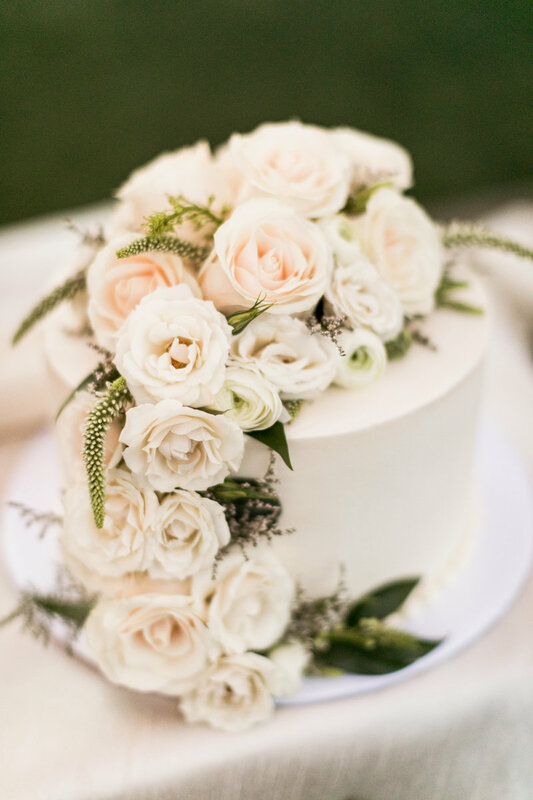 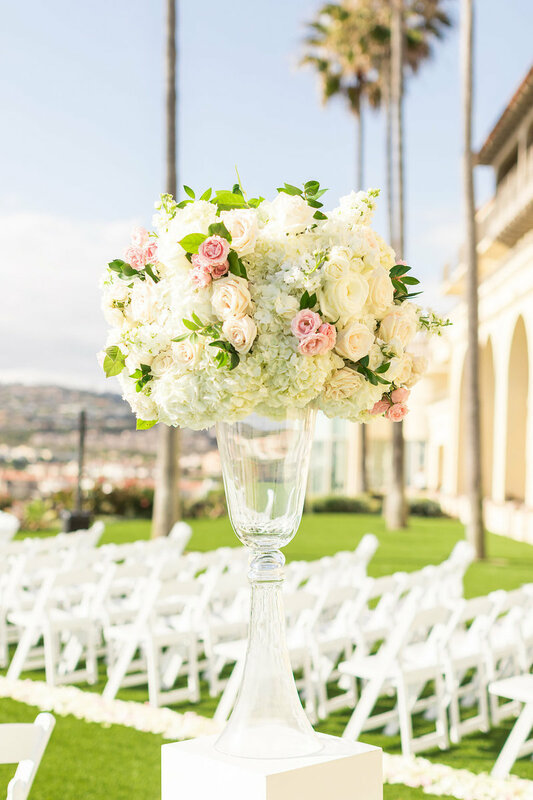 There's just something about a blush palate wedding that never gets old and it truly complimented the amazing coastal views of the Ritz Carlton Laguna Niguel. 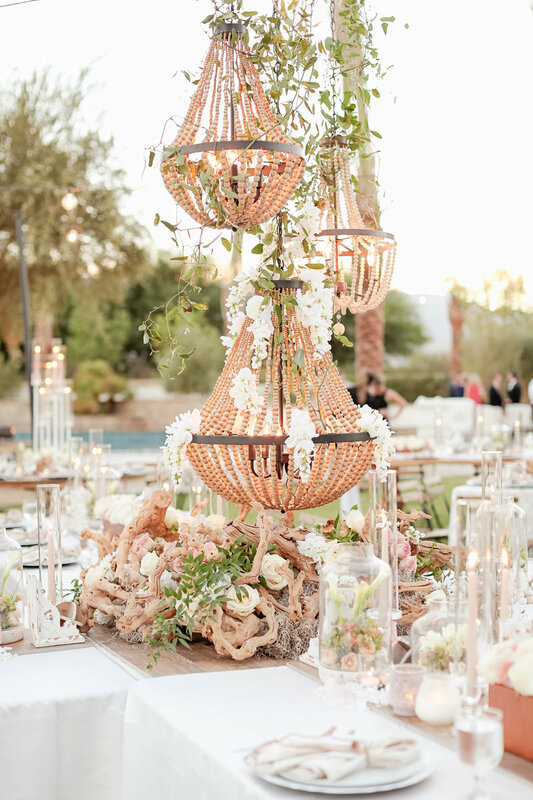 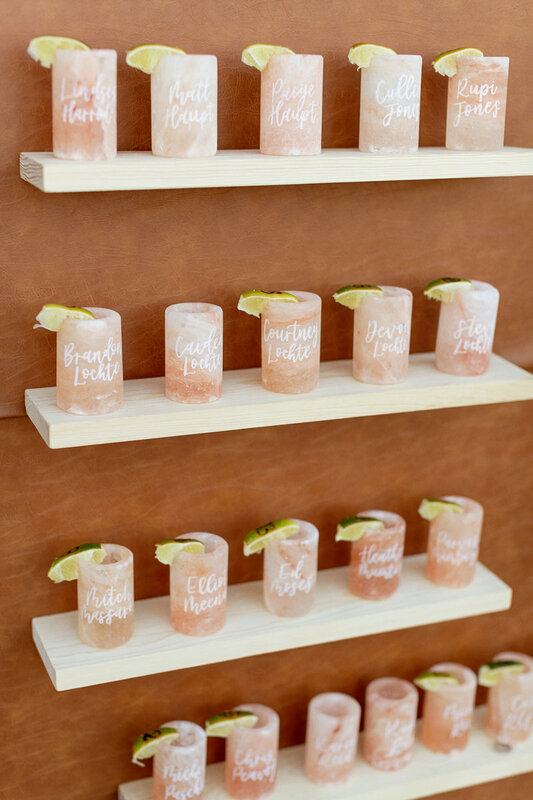 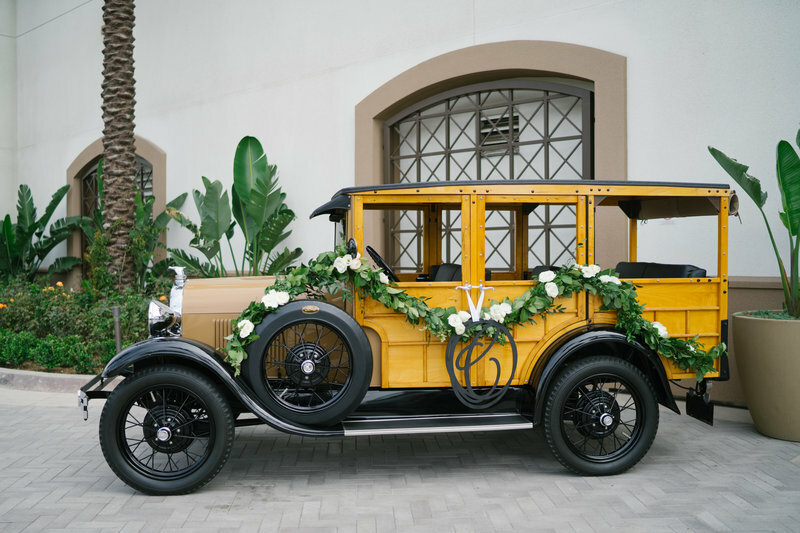 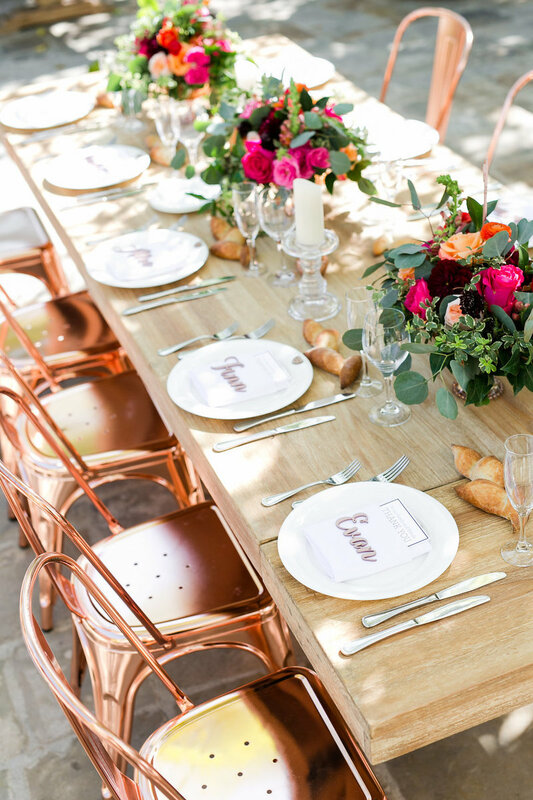 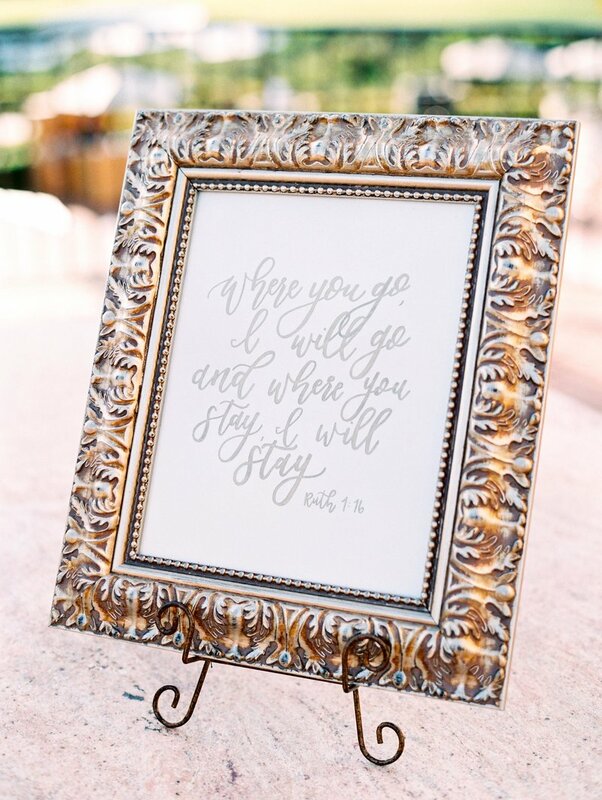 This wedding has inspiration written all over it! 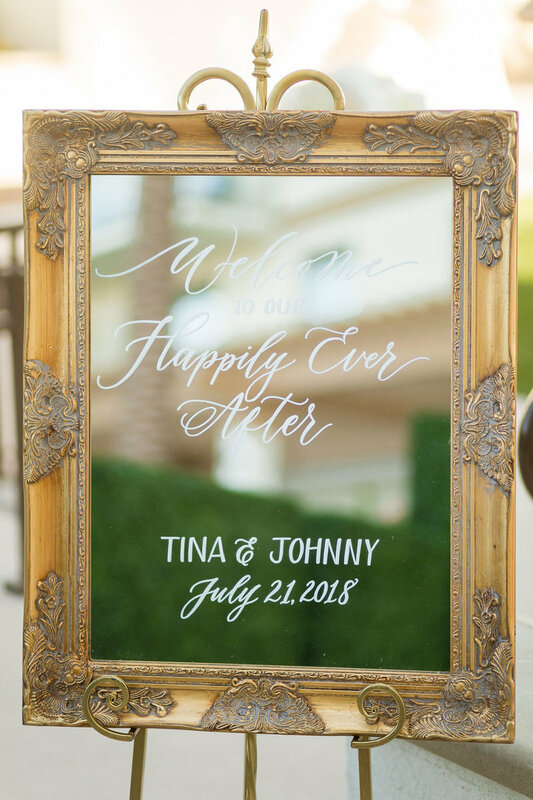 Tina and Johnny’s big day was a dream. 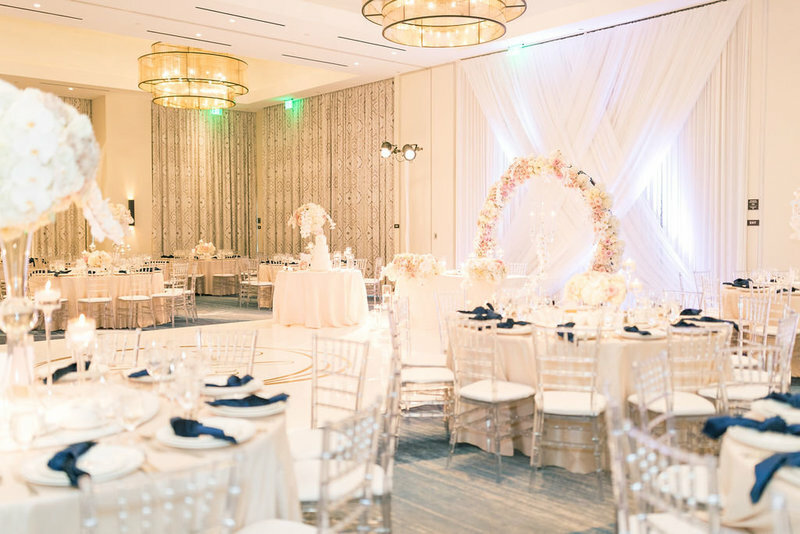 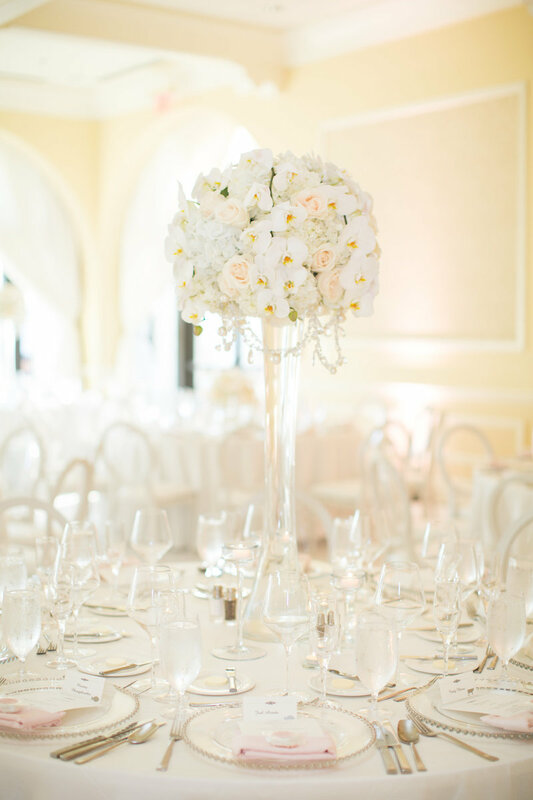 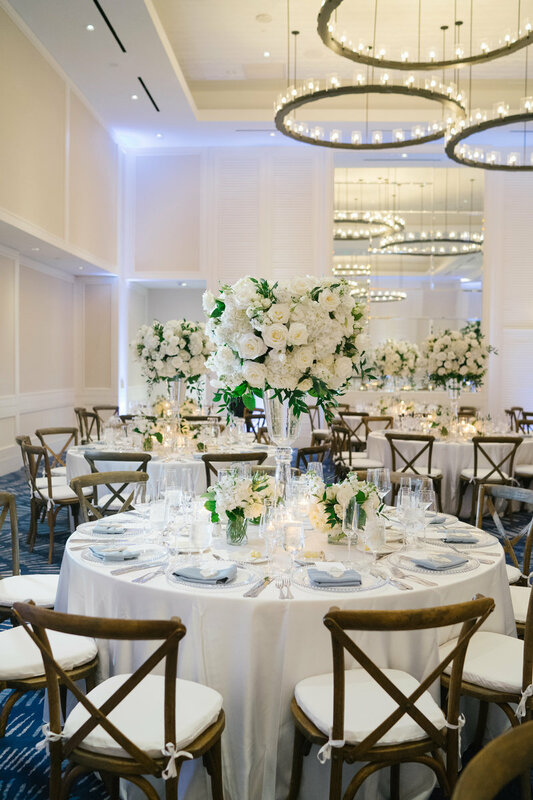 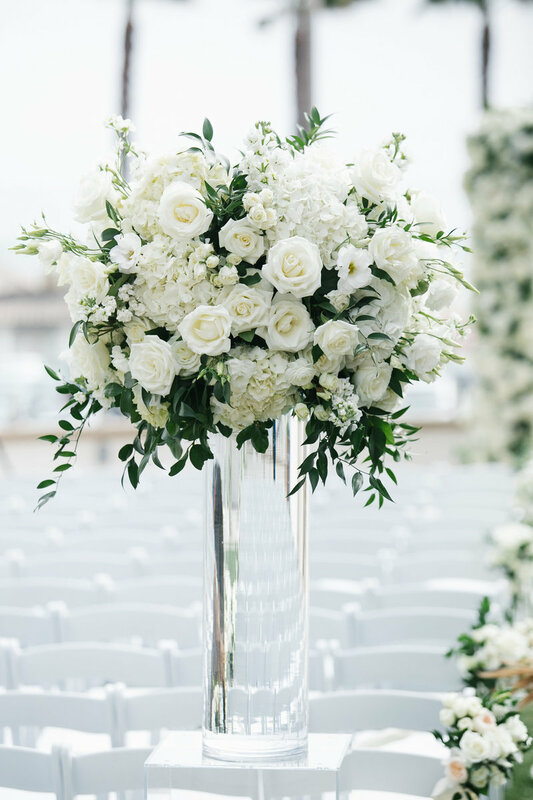 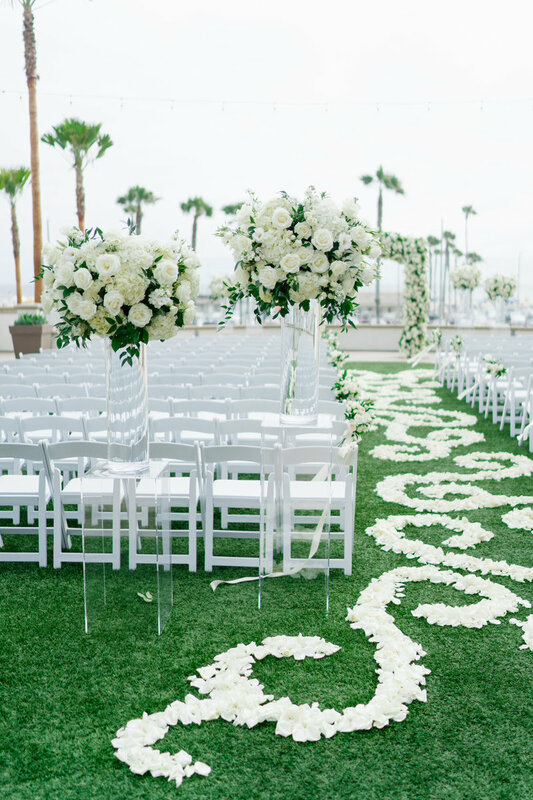 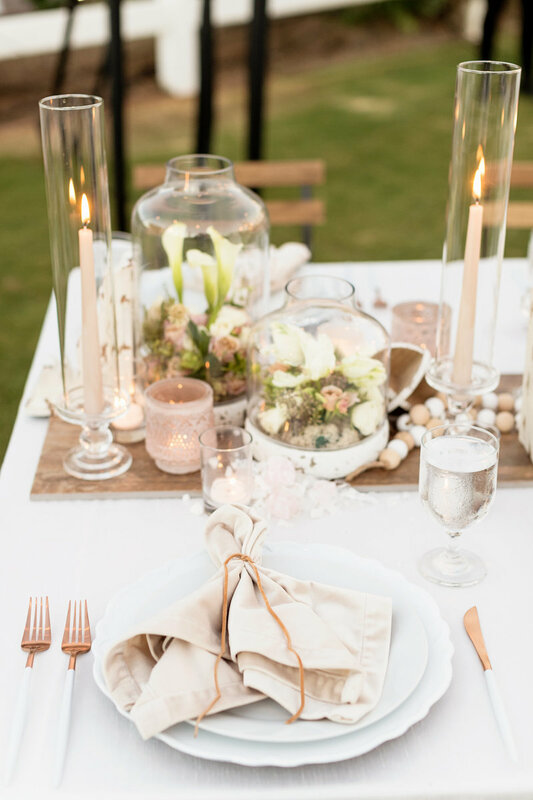 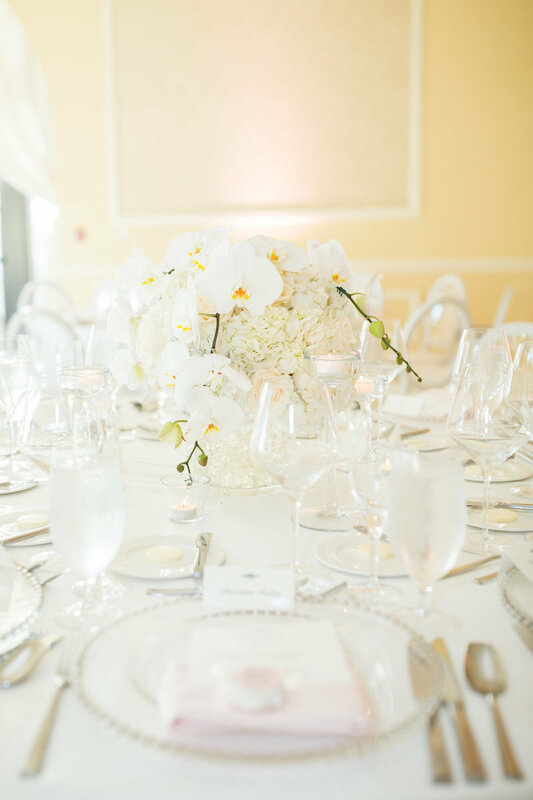 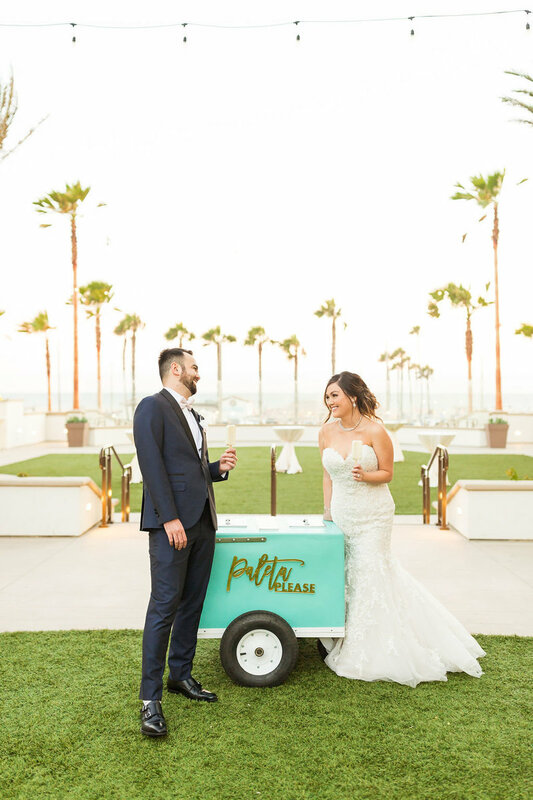 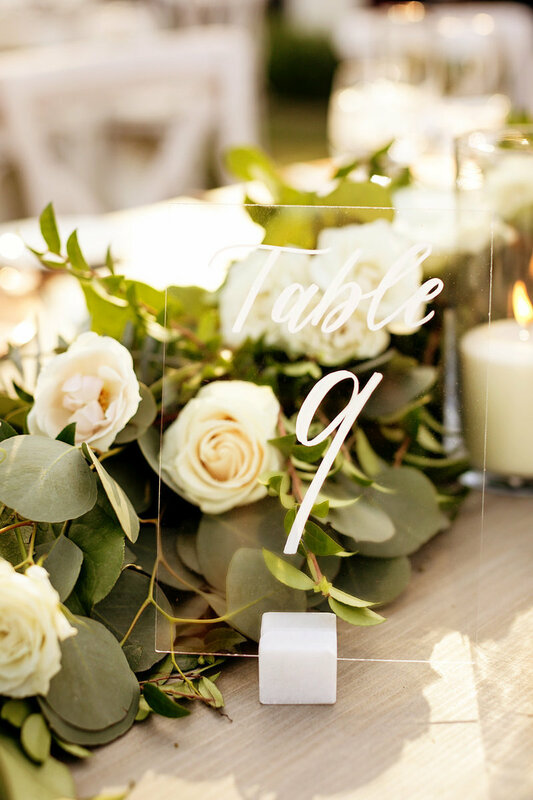 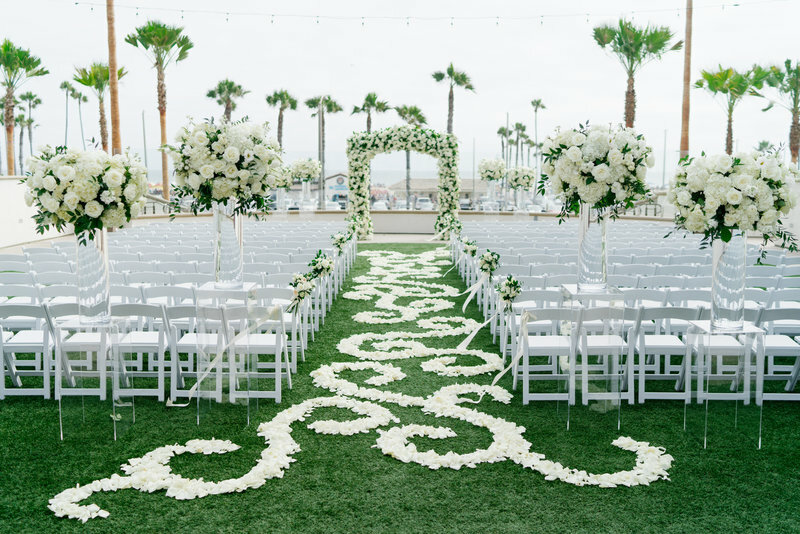 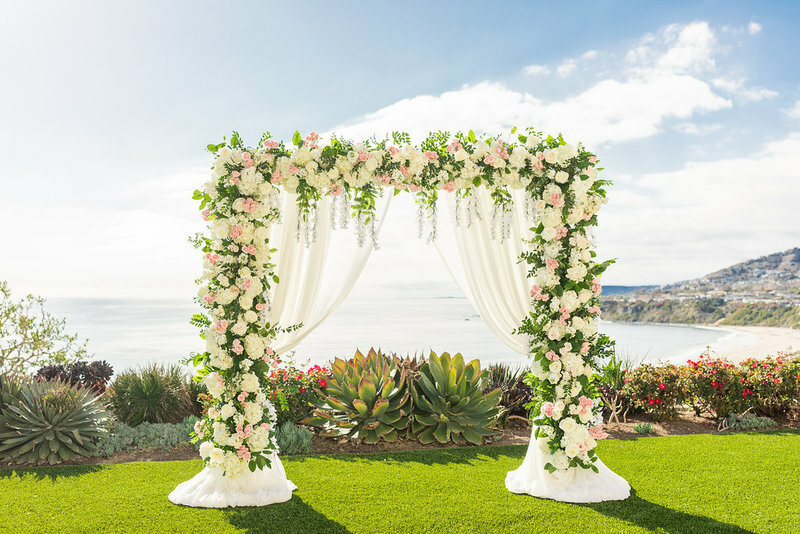 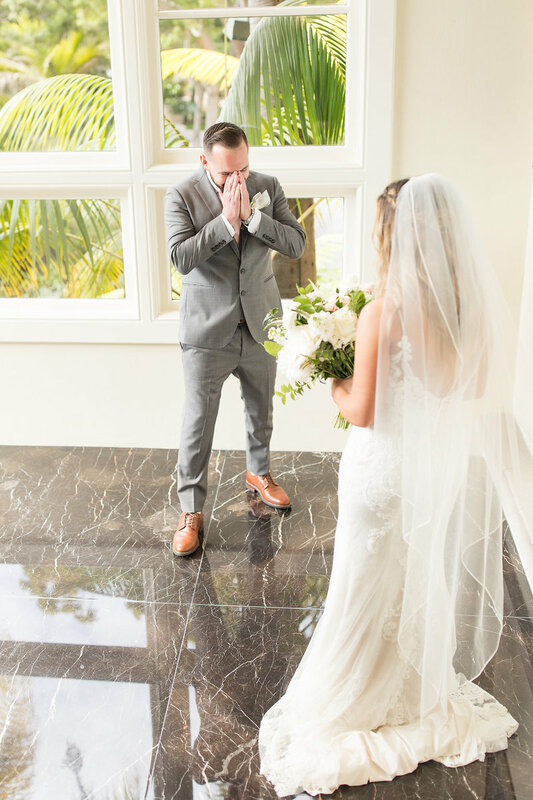 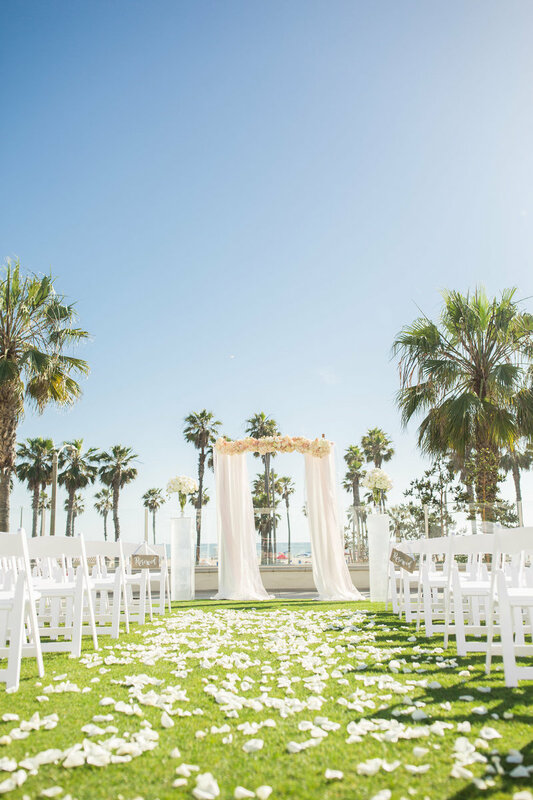 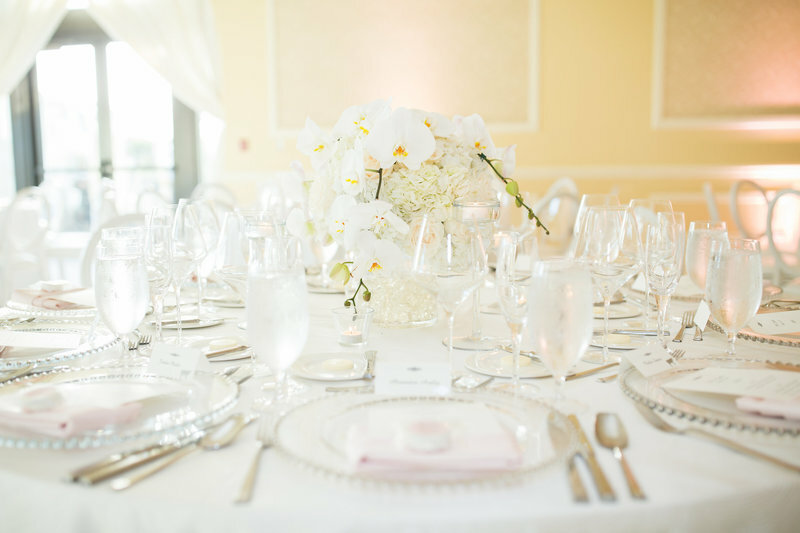 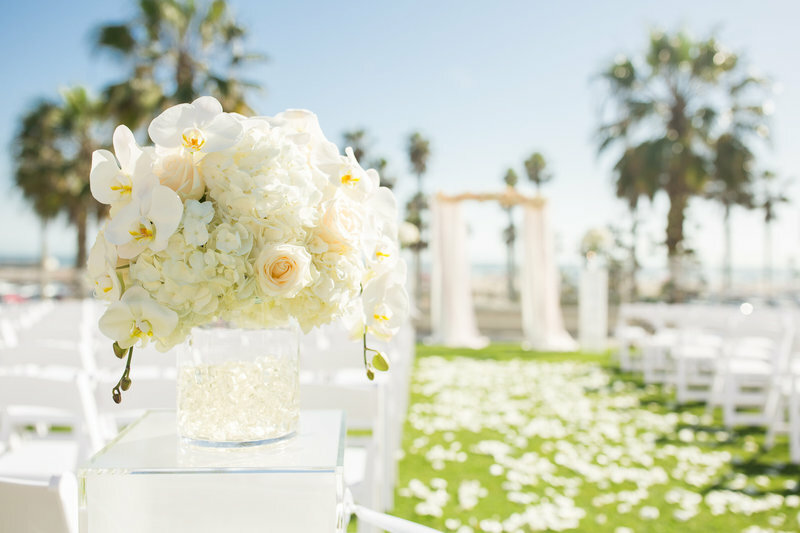 Taking place at the Hilton Waterfront, they complimented the ocean view with their round arbor, beautiful white and blush florals and clear chairs. 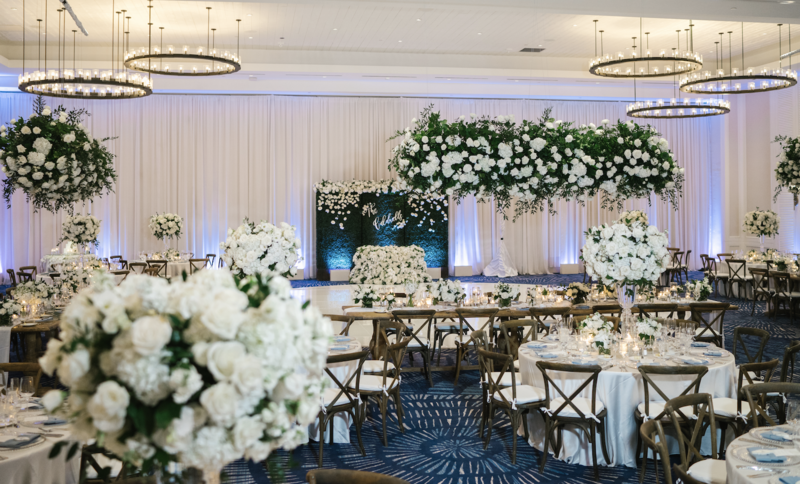 The reception space truly transformed into something special. 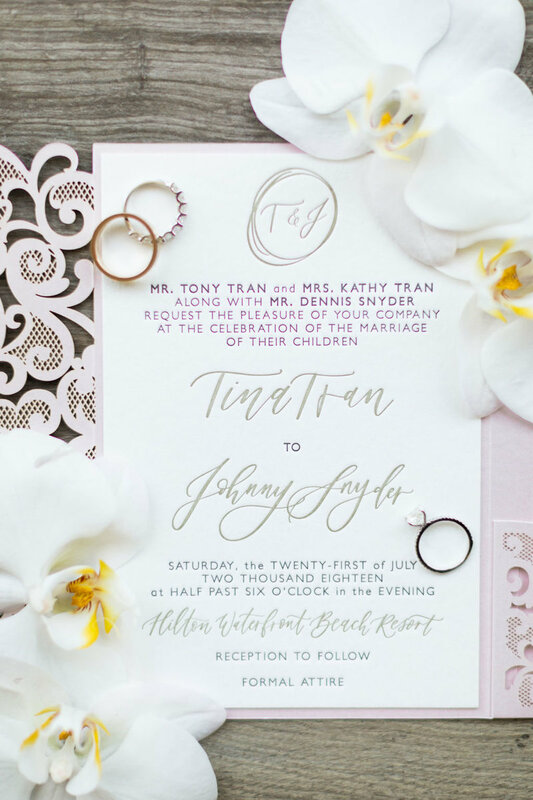 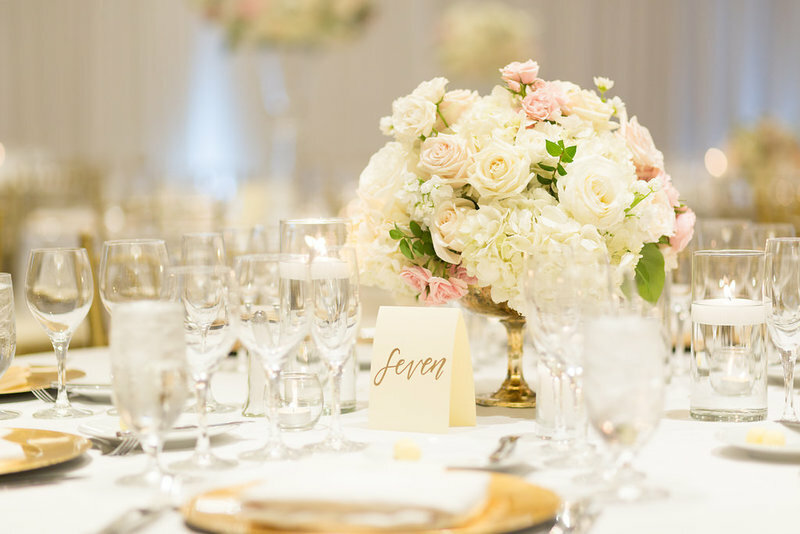 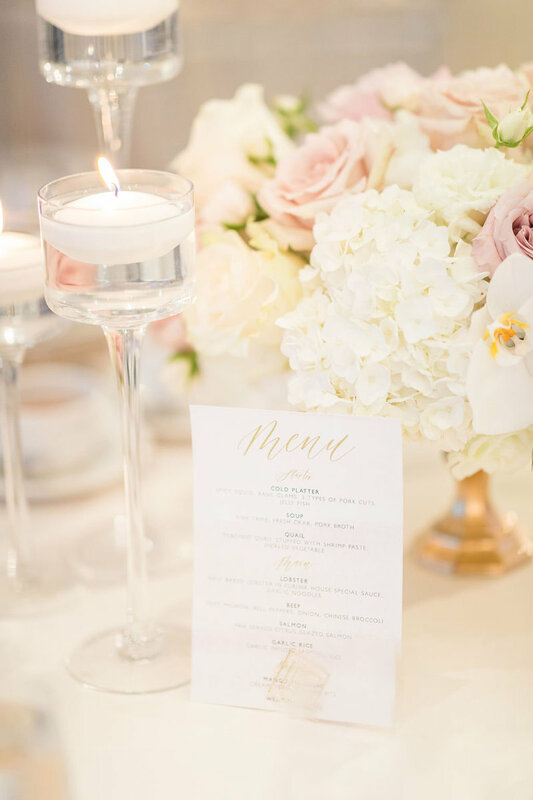 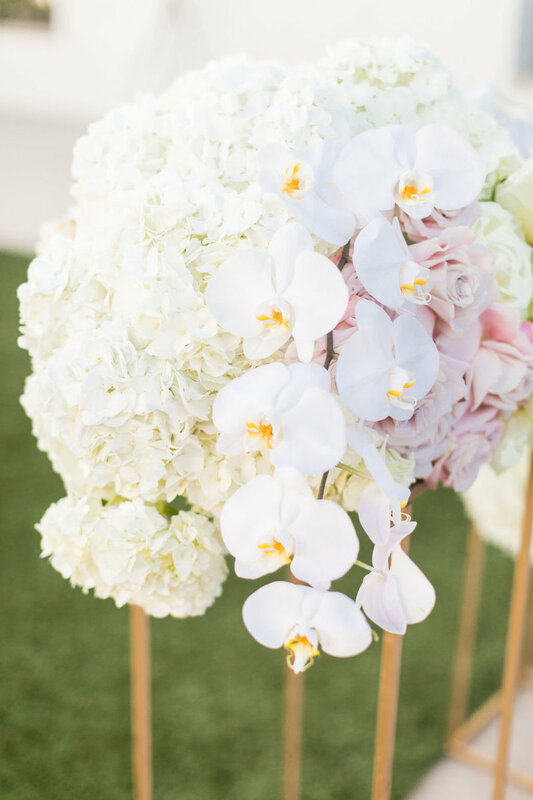 Soft tones, an abundance of lush Florals dripping with orchids, velvet napkins and tons of candles. 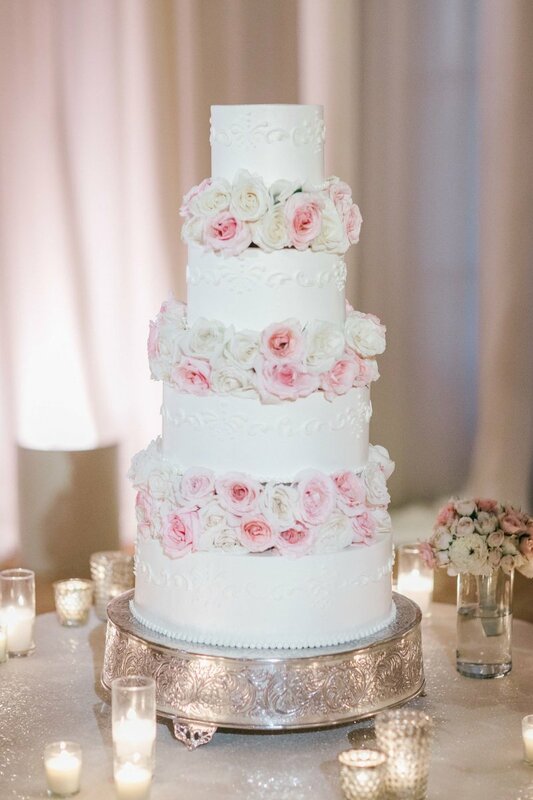 Words don’t do it justice, though! 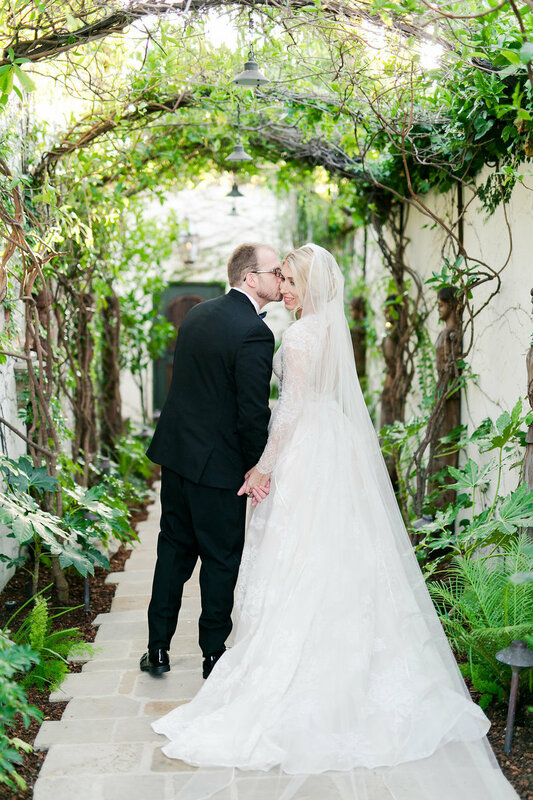 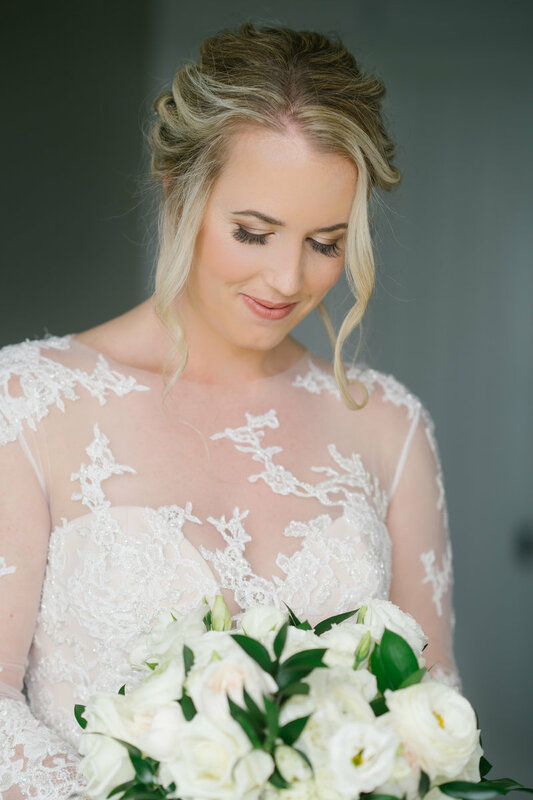 This wedding day was nothing short of breathtaking! 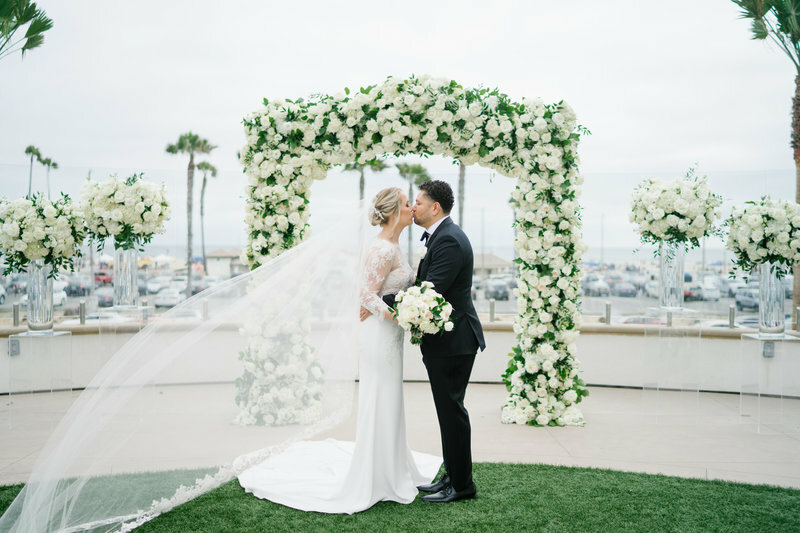 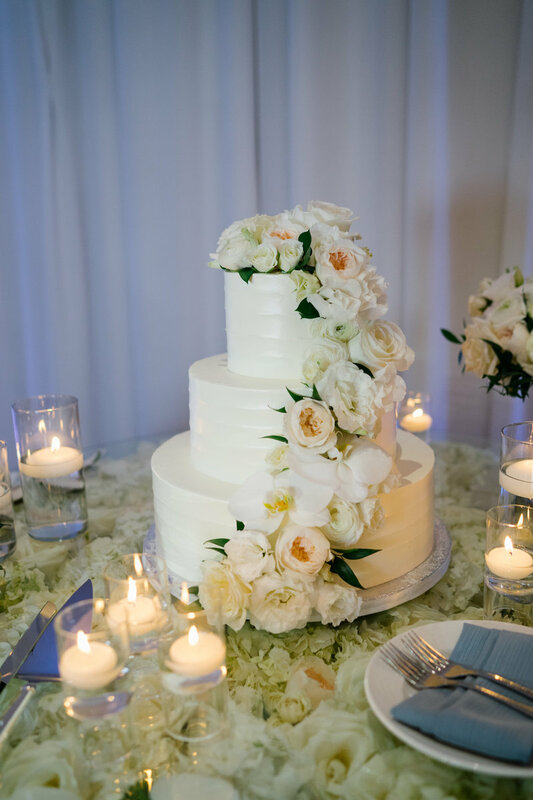 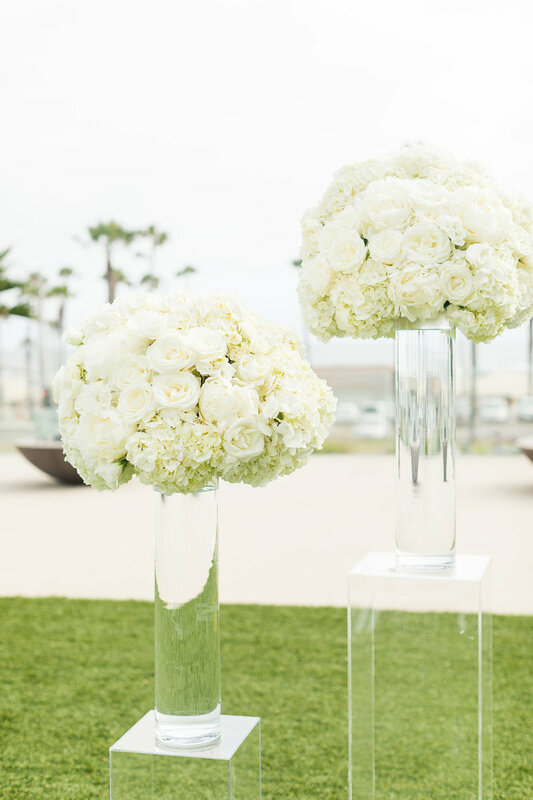 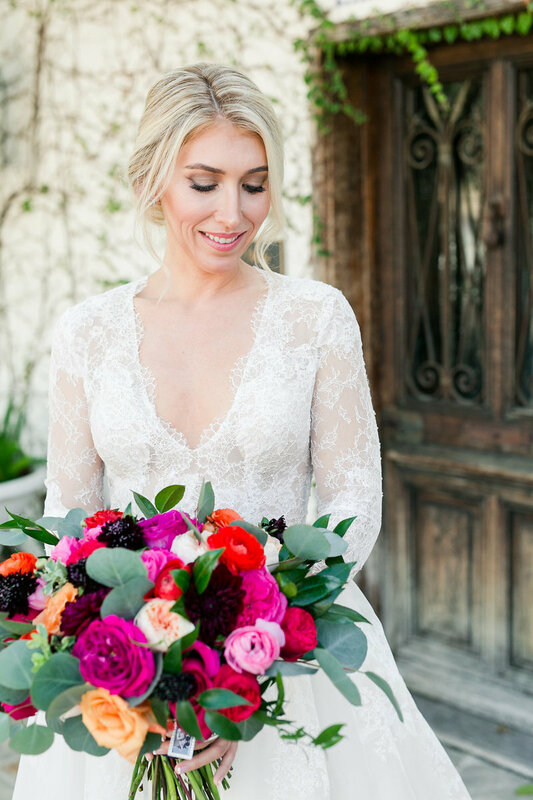 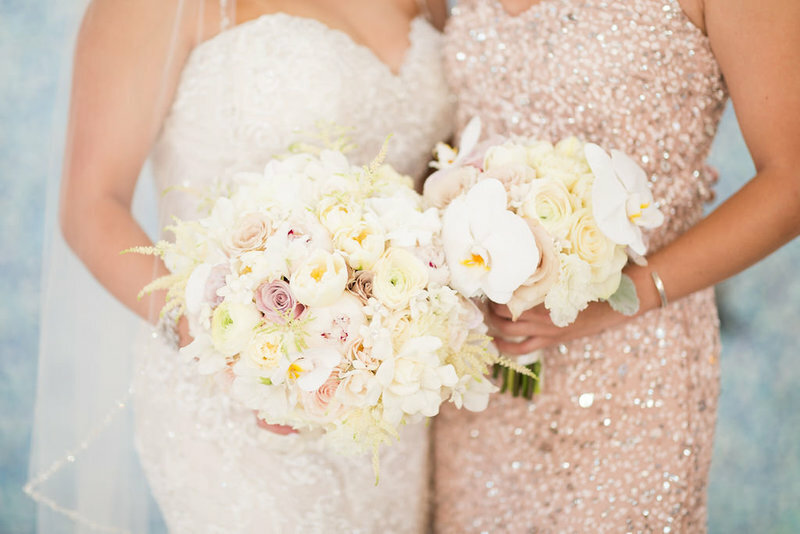 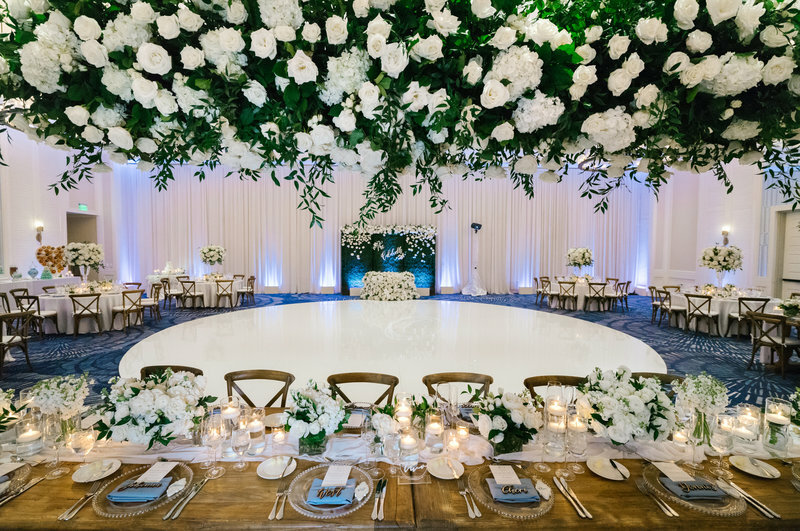 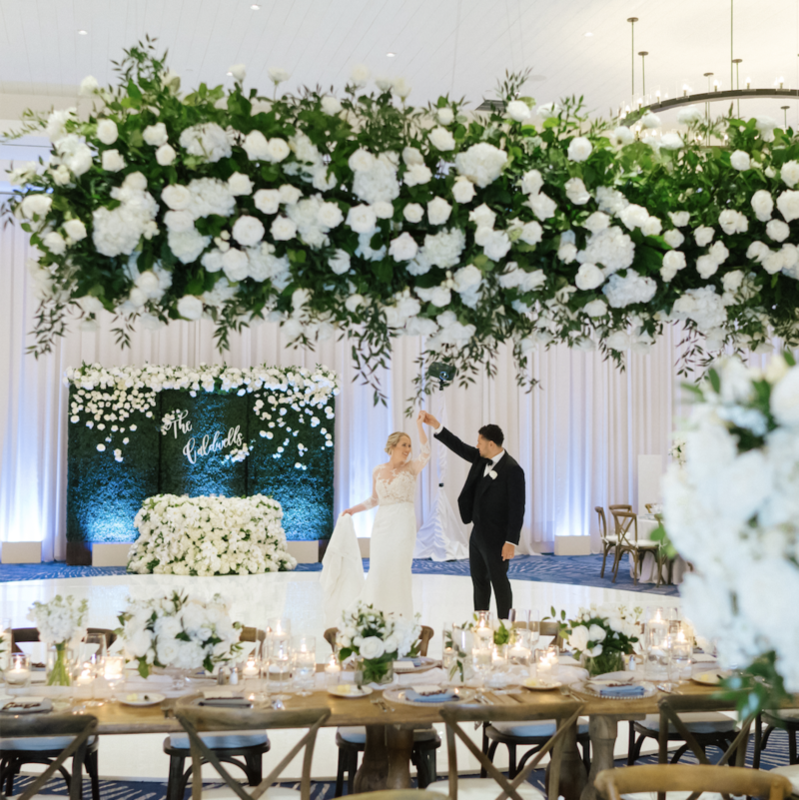 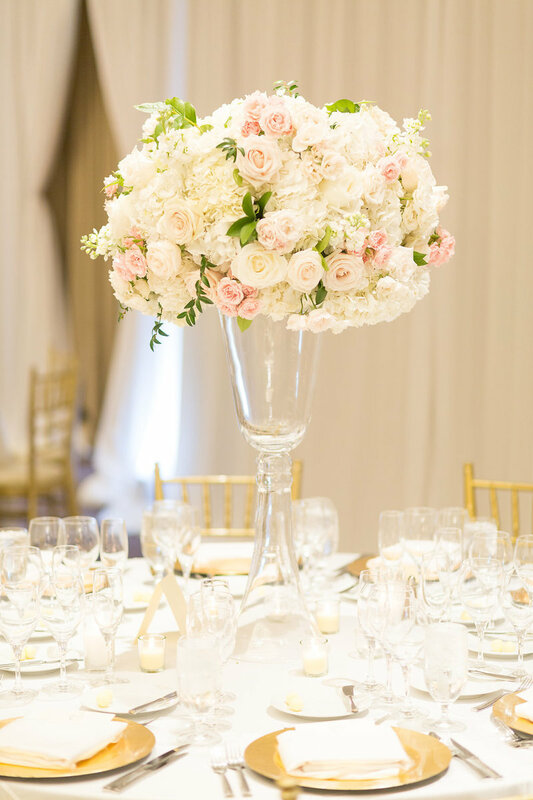 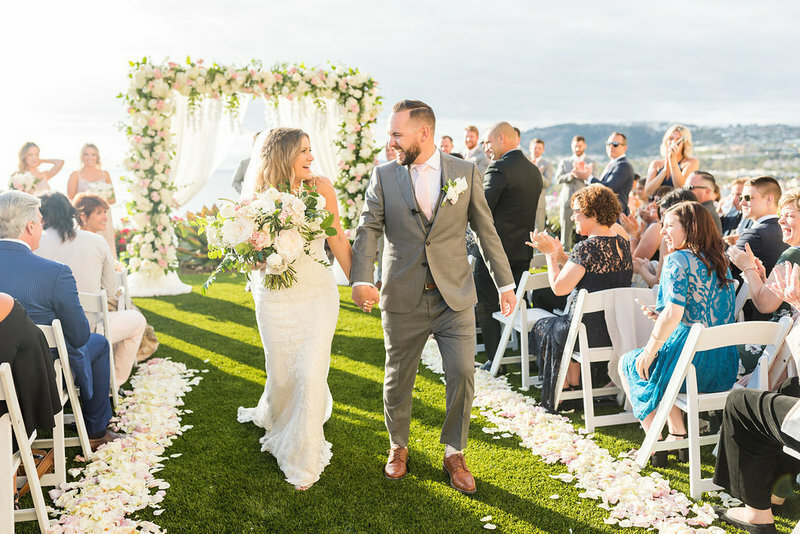 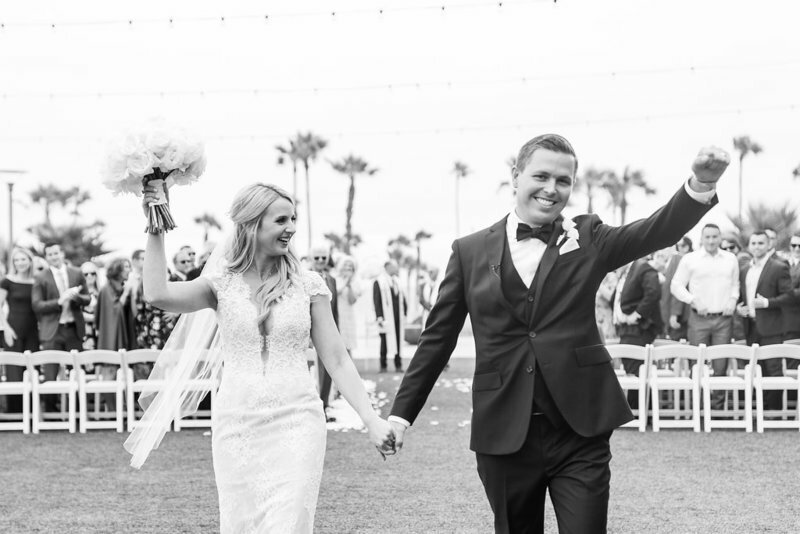 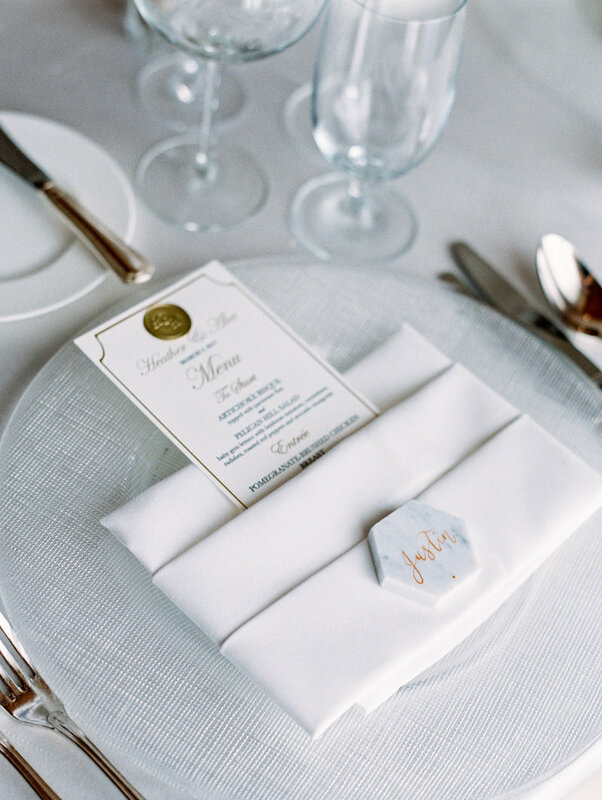 This couple had a gorgeous vision of florals and coastal views! 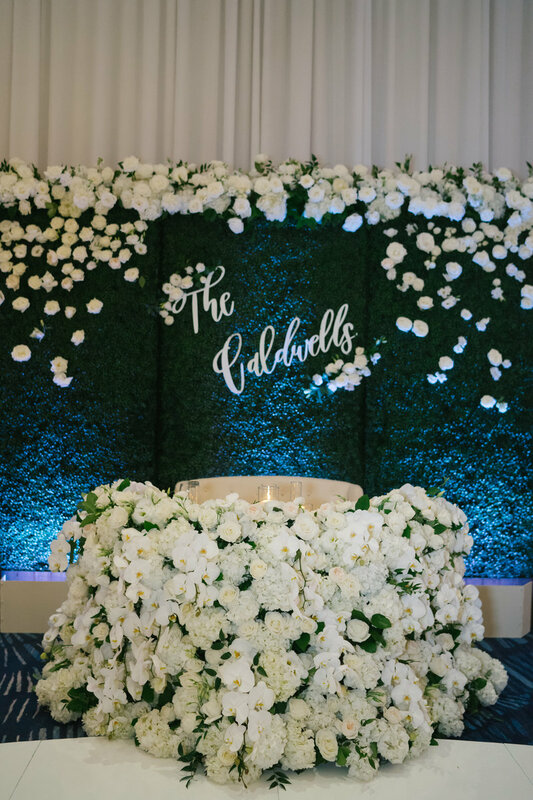 From the ceremony aisle design, to the incredible sweetheart table, to the oversized hanging floral pieces, you couldn’t help but be in awe! 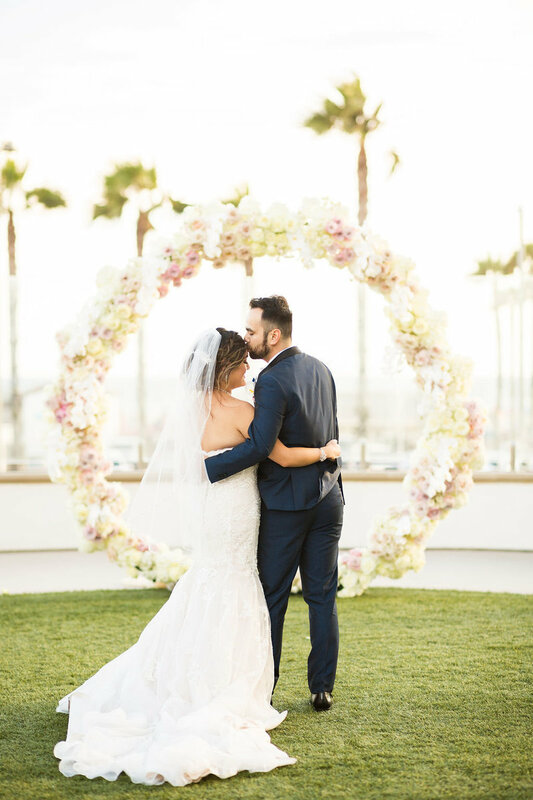 These two were such a fun loving, awesome couple and wanted their day to be unique to them, and they accomplished this throughout their whole design! 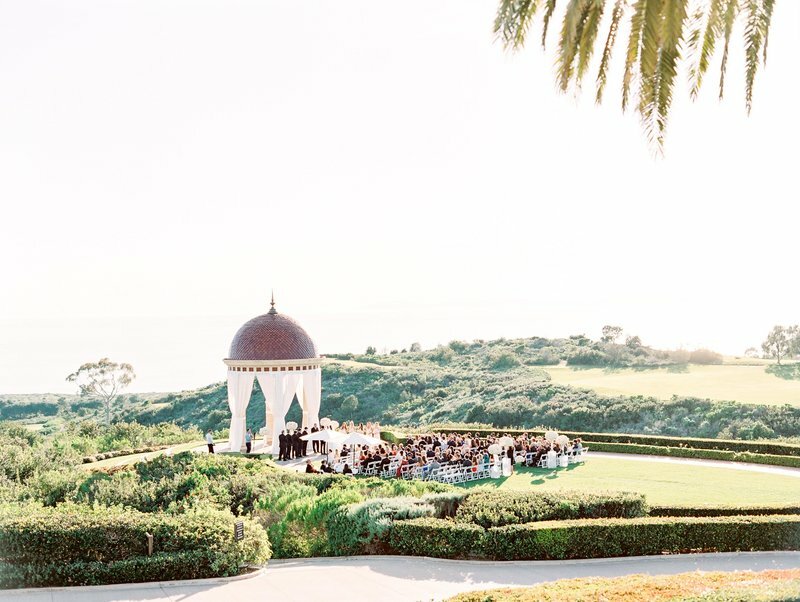 Talk about the perfect day for the perfect couple at the perfect venue! 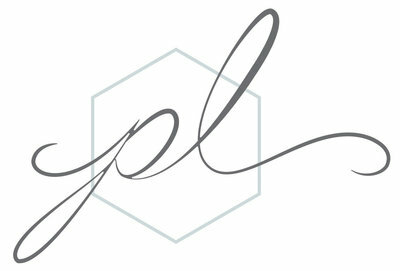  We beamed the entire planning process. 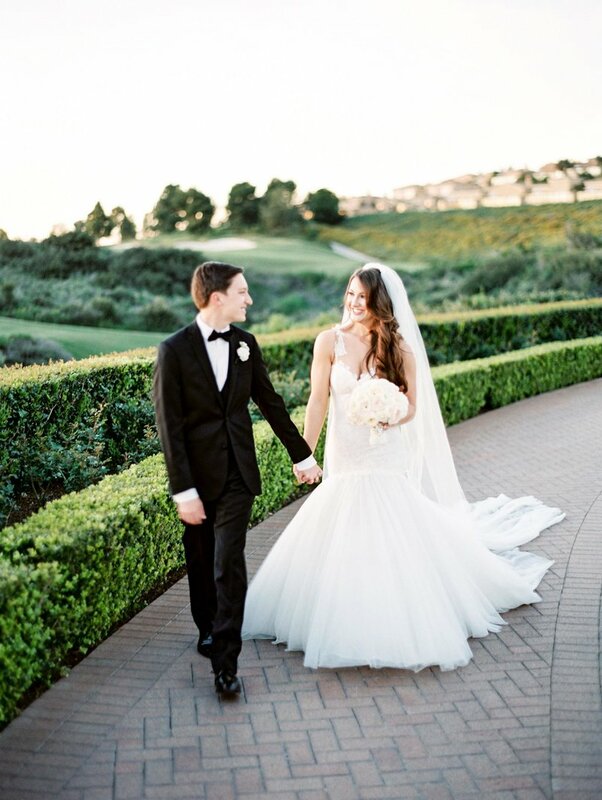 From working closely with JP & Joelle (your stomach would hurt after every meeting from laughing SO hard!) 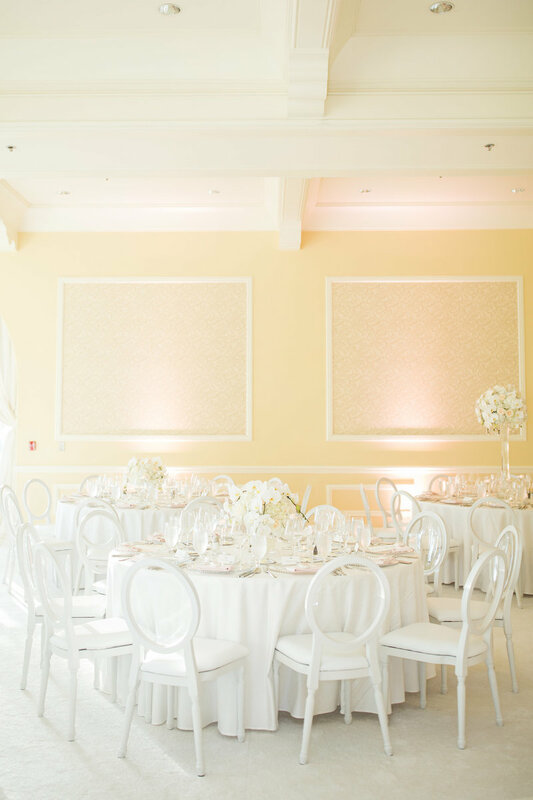 Lauren on design to managing dozens of vendors the day was unrivaled. 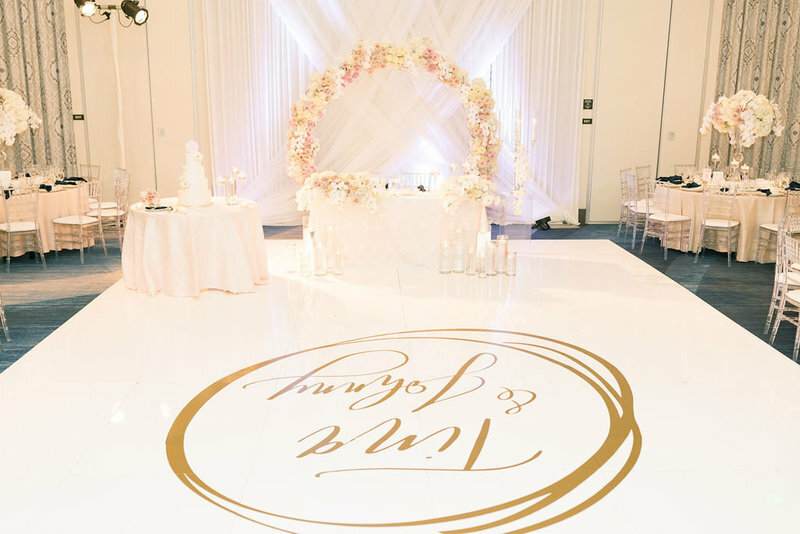 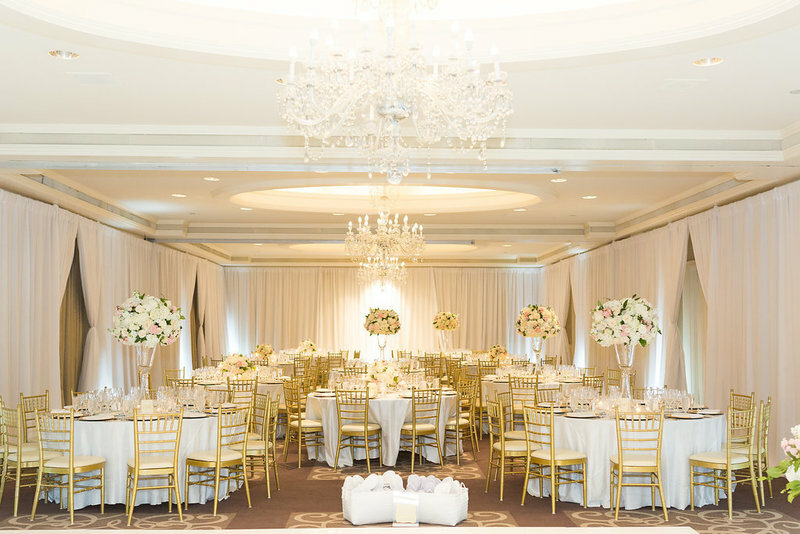 The pure white ballroom took guests breath away as they entered. 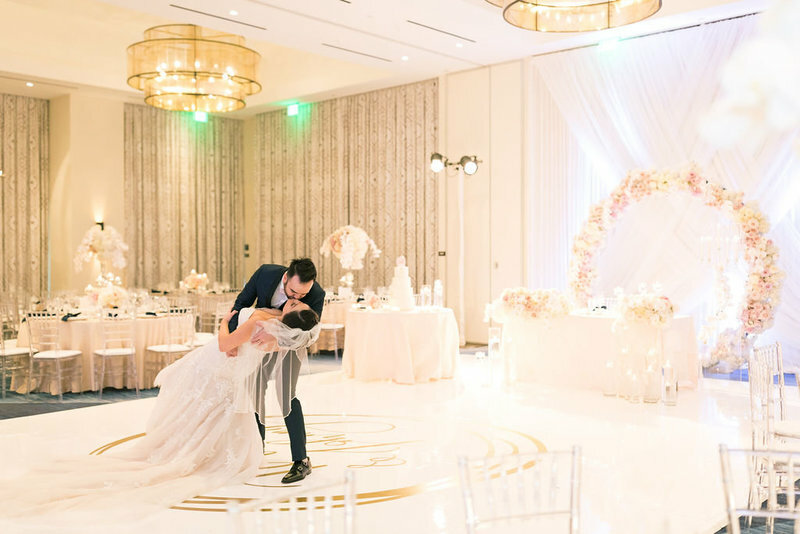 Of course the seamless white dance-floor didn’t hinder their guests from dancing the night away. 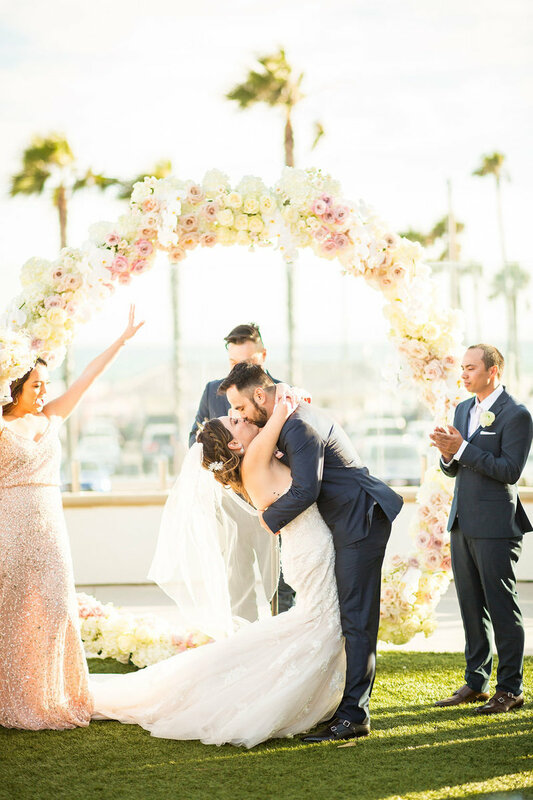 They partied until the early morning alongside the beaming bride and groom!